It was 7am when we received our breakfast of freshly-squeezed orange juice, milk, croissants, toast, and numerous spreads. Not long afterwards, we got our stuff together, checked out of the Santa Monica Aparts, and proceeded to drive off to Torres del Paine on a full tank of diesel. 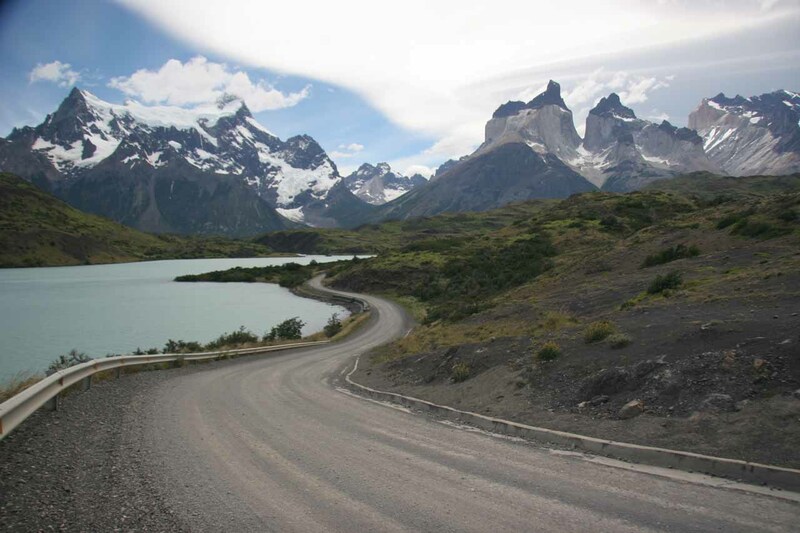 With our somewhat early start, we expected to be able to make it Torres del Paine without too much difficulty like overtaking slower trucks or tour buses. We did have some fears about whether we’d get lost since there were more than one border crossing and the roads down here weren’t guaranteed to be well-signed nor well-maintained. 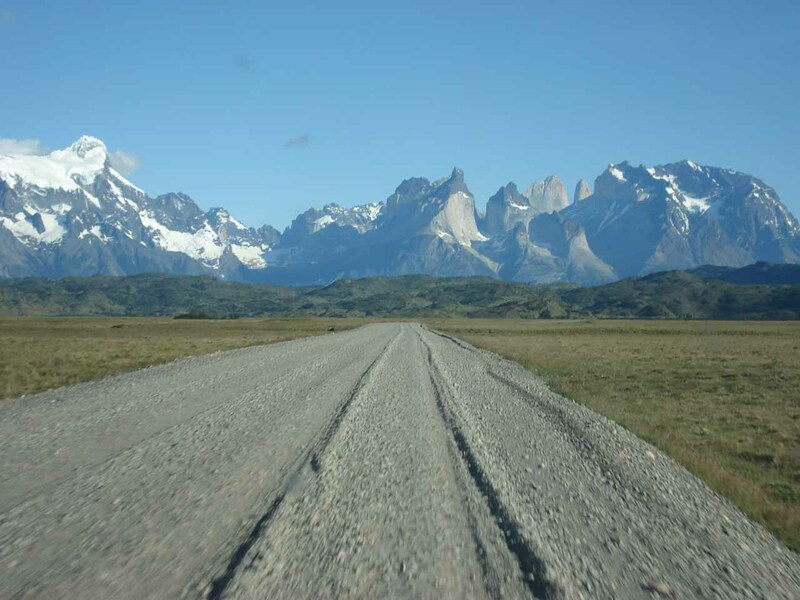 But in any case, by 8am we proceeded to leave El Calafate and drive south along Ruta 40, which then continued at a junction as an unpaved road. The next hour or so along this gravel road pretty much featured rabbits and ostriches scurrying about to get out of the way. A few birds picking at roadkill or crossing the road also were seen. Surprisingly, the unpaved road was very wide (easily able to accommodate at least four or more cars in parallel it seemed) so overtaking wasn’t too much of a concern. The only real concern was possibly losing control of the car due to the gravelly surface if we went too fast or if rocks get thrown around in our direction and chip our windshield. Way out in the distance, we could see what looked like pinnacles. I indicated to Julie that those might very well be the famed Torres del Paine (or Towers of Paine). They didn’t seem that far away, yet we knew it was still supposed to be around a 6-hour drive. Plus, it seemed like we were actually moving away from the towers. Nonetheless, the road would eventually rejoin a paved road near a gas station and we turned right. From there, the road smoothly continued amongst desolate desert lands. There was even a salt flat with flamingoes in it. 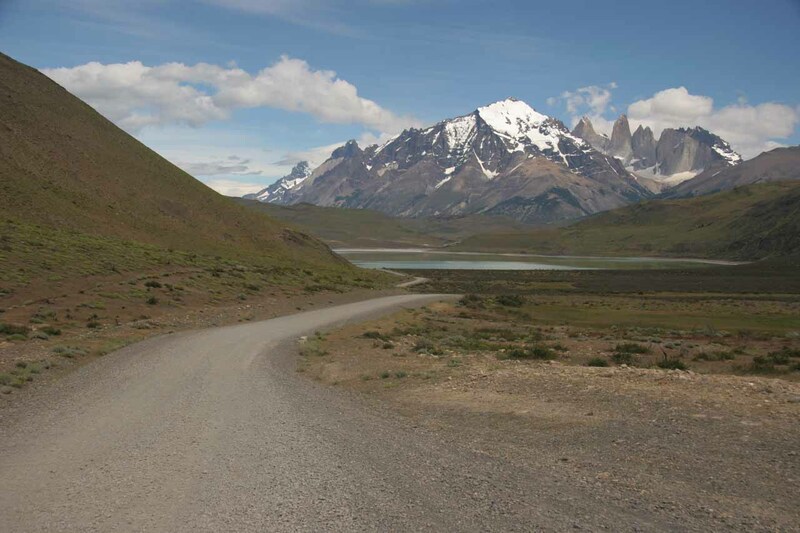 While on the paved road, we consciously looked for a turnoff that would lead us to the most northerly of the Chilean border crossings in the immediate vicinity. Our fold out map said that a nearby landmark to look for was some place called La Estancia Cancha Carrera. So I kept that in mind as we actively looked for turnoffs that were significant enough to be a legitimate road. Finally, we saw a sign that said “Paso Cancha Carrera.” There was no sign indicating Torres del Paine, which generated some doubt, but the Cancha Carrera name was unmistakable so we took the turnoff and got back onto an unsealed road. After a few minutes, we arrived at what appeared to be someone’s driveway and a chain-linked barricade blocking further progress on this road. At first we thought we had gone the wrong way, but upon further inspection, we saw an Argentinean flag and we heard some voices from inside the humble-looking building. Perhaps this was the border control facility? So we stopped the truck and proceeded to walk in with the paperwork provided by Hertz along with our Passports. Sure enough, we were welcomed with signs about border patrol saying something to the effect of “Dear Mr. Tourist…” So this must be it. Apparently, we interrupted their game of table tennis (Ping Pong) as we heard the characteristic sounds of the ping pong ball hitting the table and paddles. But when we got to the window, three border patrol workers slowly went from grins and smiles to business as they looked over our papers and had us fill out some customs forms. None of them spoke english so fortunately we knew enough spanish to keep things rolling. A few more people showed up after us including an elderly Japanese couple that didn’t speak any spanish. Julie was kind enough to help them with the border patrol requests and questions before we were done. While the officers were busy and our paperwork was complete, Julie lowered the chain, I passed the barricade, Julie put the chain back on, and we took off. A few more minutes of driving later we got to another border patrol station. This one must be the Chilean border patrol and customs as evidenced by the Chilean flag waving outside. Once again, we stopped the car, took out all our paperwork, got rid of the free apples we brought from Santa Monica Aparts, and entered the building. There were separate windows in this facility and we attended each one filling out forms and furnishing paperwork as we went. It didn’t seem all that busy this morning so within another half-hour, we were out of there. Just beyond the border post, there appeared to be some souvenir shops. We didn’t bother stopping for those nor did we figure on stopping for any more fuel (even though there was a sign indicating there was one around). The needle was still on the “F” so perhaps in a show of cockiness, we pressed on to Torres del Paine knowing there wouldn’t be any gas in the park. 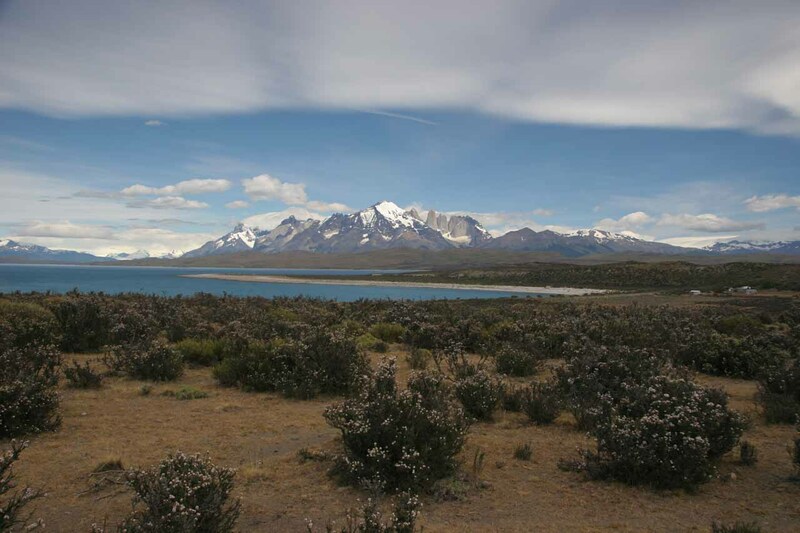 It didn’t take long before we started to get more roadside views of Torres del Paine. 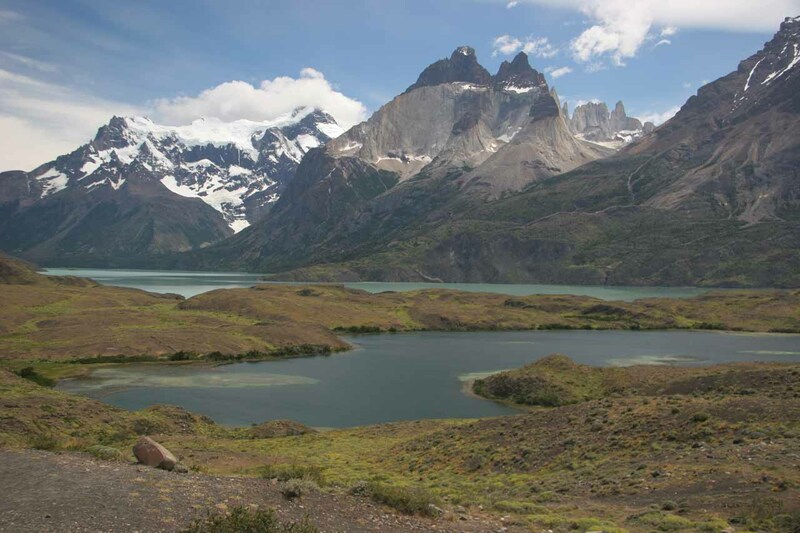 We stopped at a mirador with a view of the southeast end of the Paine Massif seen over the shores of Lago del Toro – another one of the lakes that looked like it got colored by glacial runoff. The next several minutes, we continued into the park with seemingly every turn presenting another photo op. 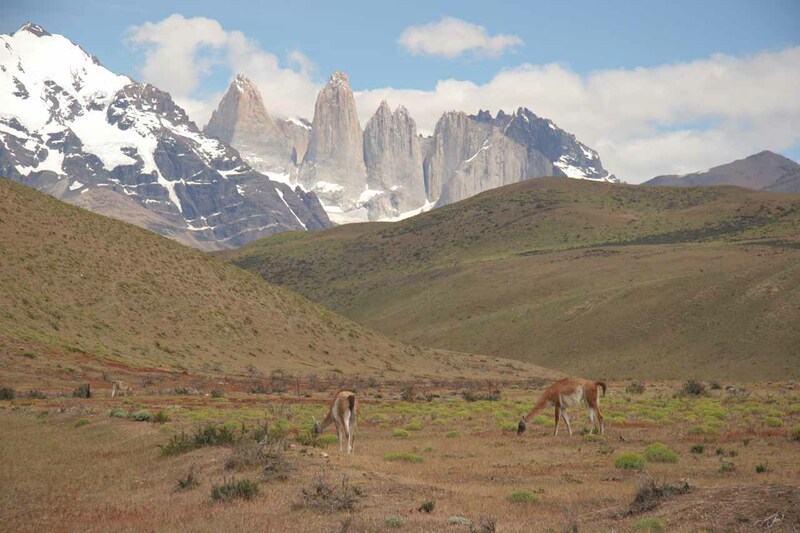 From llama-like guanacos grazing before the Torres del Paine to the Cascada del Río Paine fronting the massif in a way reminscient of the Snake River before the Grand Tetons, today was shaping up to be one of those stop-and-go days where we would constantly ask each other whether we should stop for a photograph. Yes, there were that many to consider, and obviously we couldn’t stop for all of them so we had to choose! 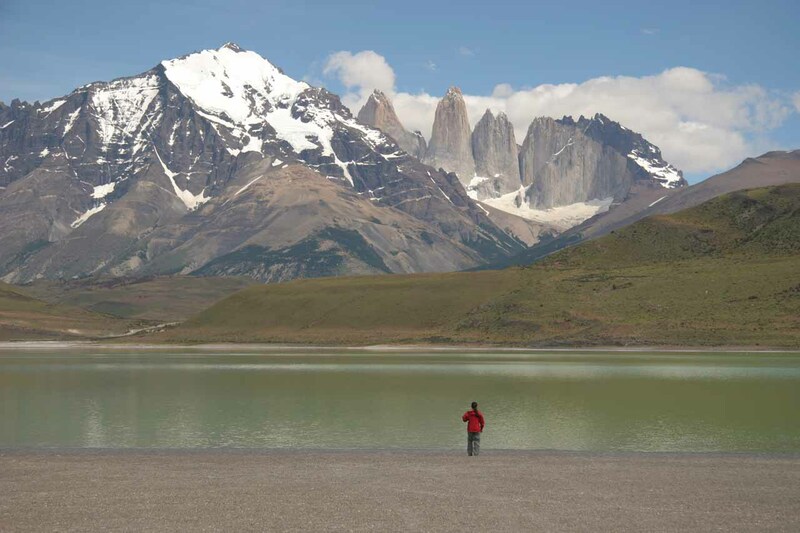 One particularly memorable photo stop was at the near shores of a small lagoon called Laguna Amarga. Here, there were black gravel shores fronted by salt flats. The lagoon itself was rippling but calm enough to produce some wavy reflections of the Paine Massif. We shared this stop with another mini-van full of tourists, but there was plenty of room to share. 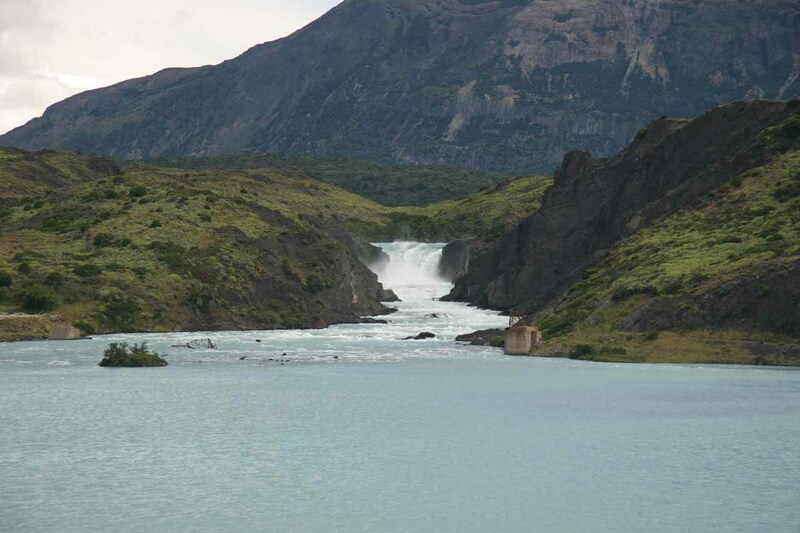 Next, we arrived at the entrance to the Torres del Paine National Park. We stopped the car to pay the admission of 15,000 Chilean pesos per person. We didn’t know it at the time, but that turned out to be over $30 USD per person! That pretty much wiped out 2/3 of our Chilean peso cash supply as the office only accepted cash. Personally, I wouldn’t mind paying such prices if I knew the funds were going towards conservation and infrastructure. But already we noticed how decentralized the park was and started to get the sense that the park money was to enhance exclusivity to the resorts as well as perhaps lining the coffers of certain interests. I guess coming from Argentina, the prices we’ve noticed in Chile were bordering on rip off. Still, the scenery was superb and I guess they’re just milking it knowing tourists would still shell out the money to take in such world class scenery. Onwards we continued through more photo stops at places such as Lago Nordenskjöld, Hostería Lago Pehoé, Lago Pehoé itself, and Explora en Patagonia. Once again this stretch of our autotouring included numerous photo stops. 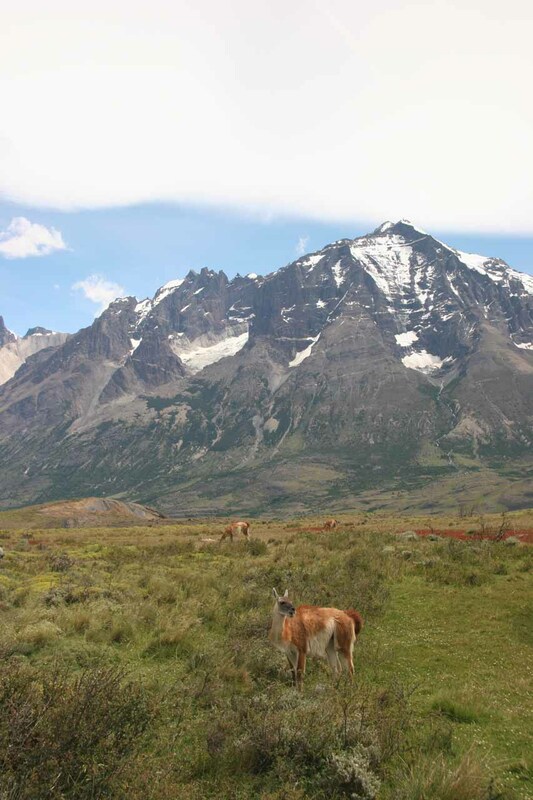 But this time, we got to see the backside of the Paine Massif which featured the Cuernos del Paine. And the sight of these glacial lakes fronting the massif was something to see. Near Lago Pehoé, we also caught a glimpse of Salto Grande, which actually didn’t look all that impressive from the unsealed road hugging the lake. But we knew later in the trip we will get up close to it. We then spent time visiting the Hostería Lago Pehoé where the lodge was extremely well situated on a small island right in the middle of the lake. 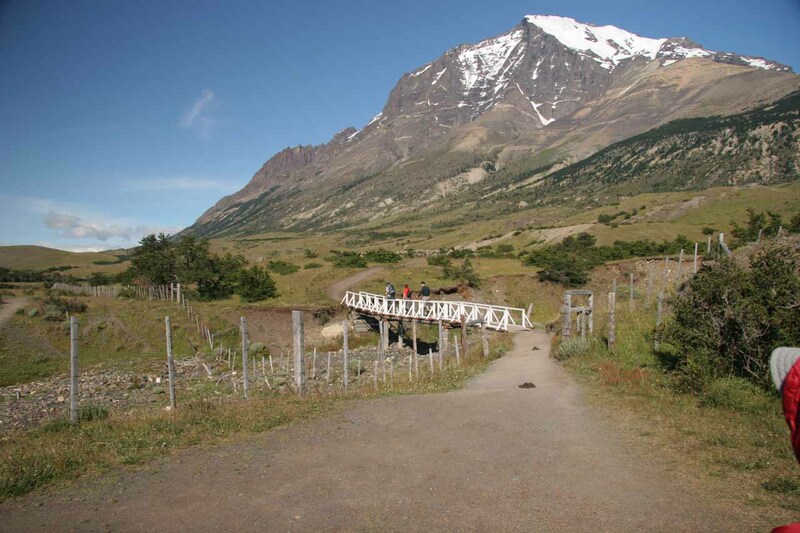 A rickety bridge allowed access to the lodge, which featured awesome views of Los Curenos del Paine over the lake. The winds were blowing hard again by now so it made us a little uneasy being on the rickety bridge knowing there was frigid water beneath us. The location was all that the lodge had going for it though. Julie wasn’t at all impressed with the rooms there as she did her little impromptu hotel visit. The menu didn’t look impressive either so we passed on having a lunch here. But despite the accommodations, we definitely enjoyed the lakeside vistas we were getting from this little island on a Patagonian Lake. We were surrounded by the turquoise waters and there were some unusual flowers blooming in the foliage all over the island as well. Next, we went to the Explora Lodge. This was supposed to be the real high-end luxury accommodation in the park. With its modern decor and well-placed boardwalks, we took the obligatory photos with the Cuernos backing the posh accommodation. 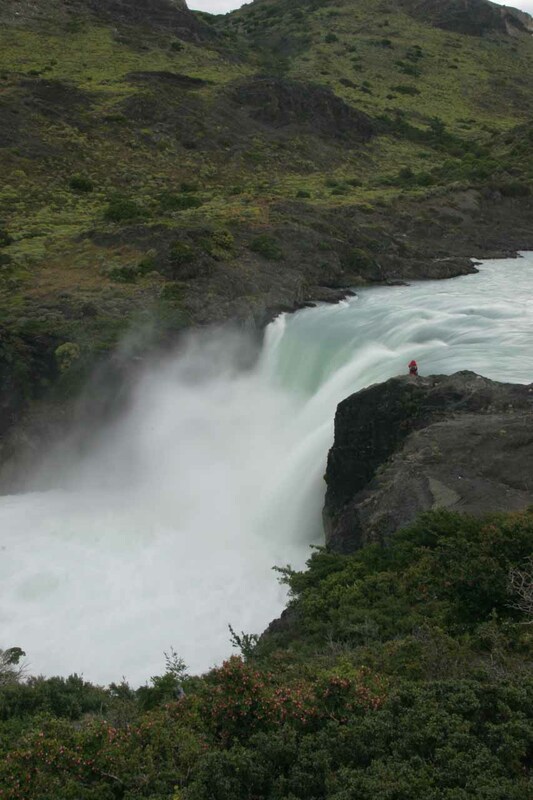 However, our motivation for coming here was to see Salto Chico. 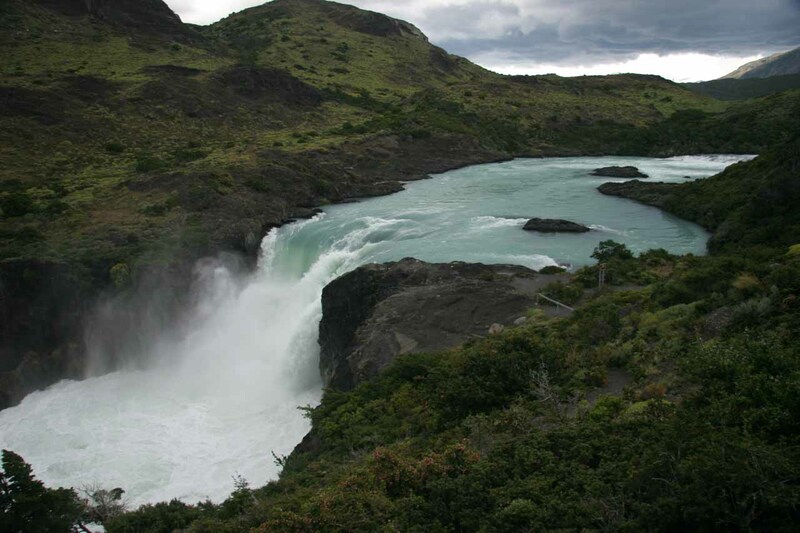 It was on the backside of the property and there was this hideous-looking building right next to the powerful waterfall, which drained Lago Pehoé. It was clear they’re tapping the waterfall to power the accommodation. Not my cup of tea, but I guess they have to make their money, right? Finally after the visit to Explora, we drove quite a distance further away (including another rickety bridge that somehow supported the weight of our truck) from the Cuernos to get to our accommodation at the Hostería Lago Tyndall. It wasn’t our first choice, but when we made our bookings nearly three months ago, everything was already booked except this one! Beggars can’t be choosers and we had read bad reviews about this place so we came in with lowered expectations. 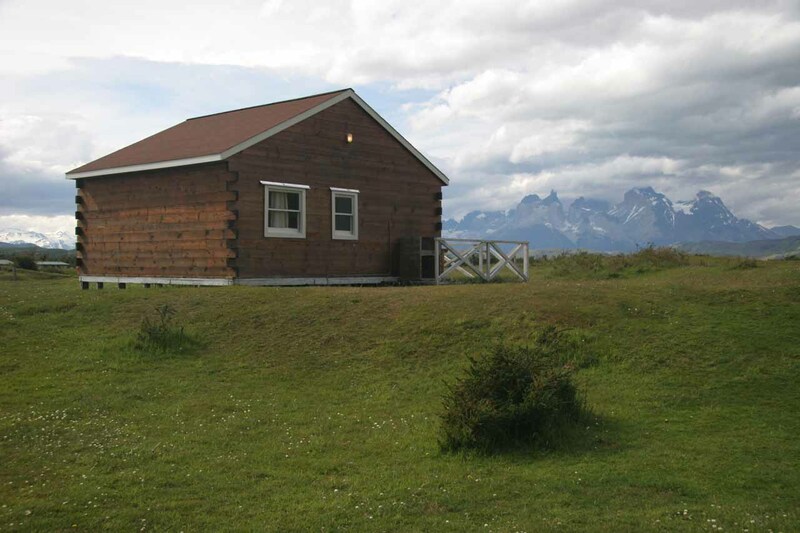 Besides, at least we had a place to stay that didn’t involving worrying about our tent getting blown away in the wind. 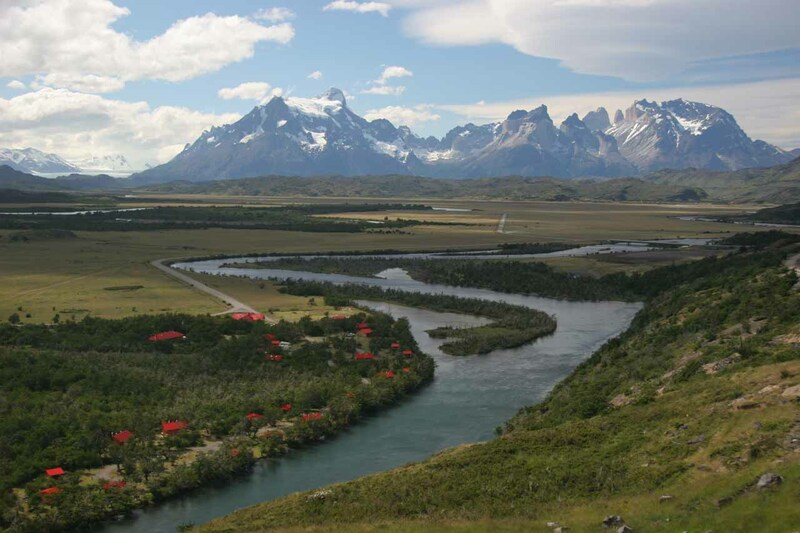 But just prior to arriving at our lodge, we did get nice views of the Paine skyline over the Río Serrano from a mirador on the top of the washboardy road on the other side of the river. None of this was on any of the maps so the access road to our accommodation must’ve been created after they drew those maps. And so we arrived at the Tyndall. Since there was no gas in the park, we kept an eye on our fuel meter. It currently stood at around 3/4 tank. I was a bit worried about how this would impact the amount of exploring in the park we could do, but I guess we’ll have to deal with it later. That’s what I get for being cocky. Regarding the Tyndall, after having seen other lodges in the park, this one looked rather average – especially at $200 USD per night. I wondered how much the other accommodations costed (well, we knew the Explora was beyond our budget). 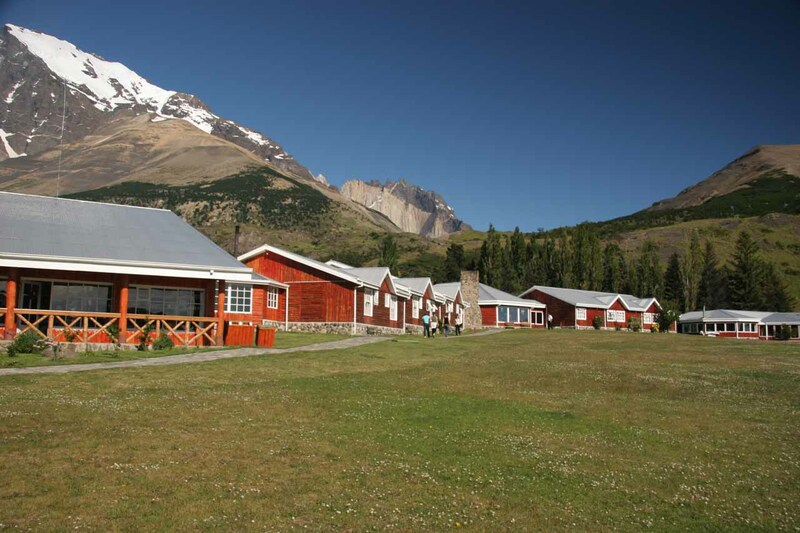 In any case, one of the first things we noticed was that many of the prices stated in the lodge were in US dollars instead of Chilean pesos. Obviously, they must get lots of Americans or other foreigners here. Nonetheless, we checked in to our basic room and then walked around in search of a place for dinner knowing that Lago Tyndall got less than flattering reviews. 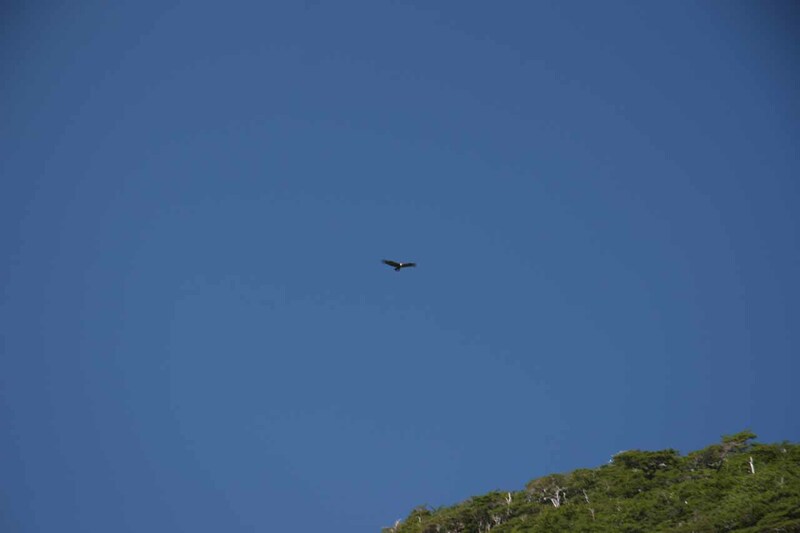 The nearest one was at Hostería Río Serrano. This one was way more upscale, but their Christmas Eve buffet at $24,800 Chilean Pesos (about $50USD per person) was beyond reason. So we eventually settled on the $20 USD per person buffet back at Tyndall. It met our lowered expectations and was quite filling after not having had anything substantial since breakfast. 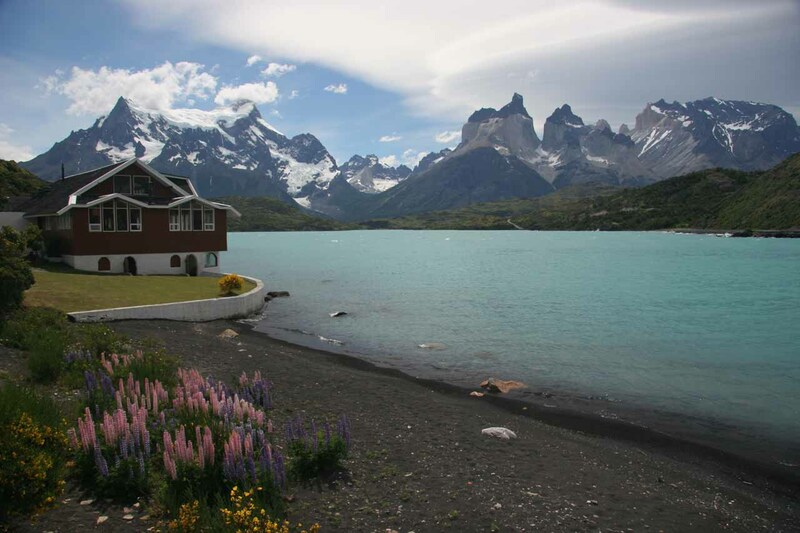 The lodge invited each guest to have champagne at 11pm, but Julie wanted to get her sleep to rest up for tomorrow’s anticipated hike to Torres del Paine’s base. 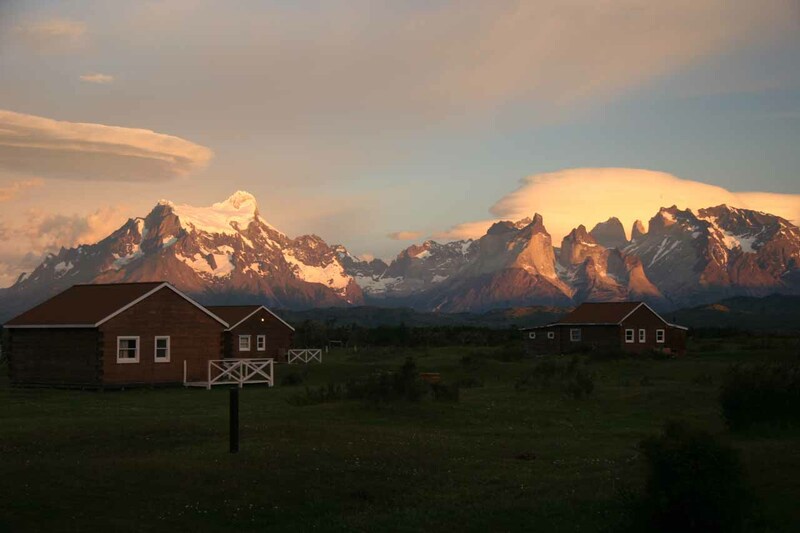 In the mean time, I stayed out on the balcony by the dining area to try to get alpenglow photos of the Cuernos del Paine. In the process, I got sucked into an engaging conversation with a Dutch couple and a German couple who were also chilling out at the balcony. 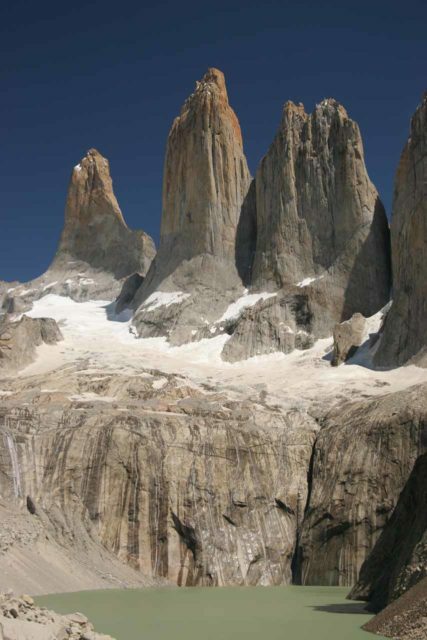 It started with the German couple talking about their experiences hiking to the base of Torres del Paine. Since that was where we were going tomorrow assuming the weather cooperates (and it turned out the Dutch couple was doing it too), we listened intently as they recounted their experiences. 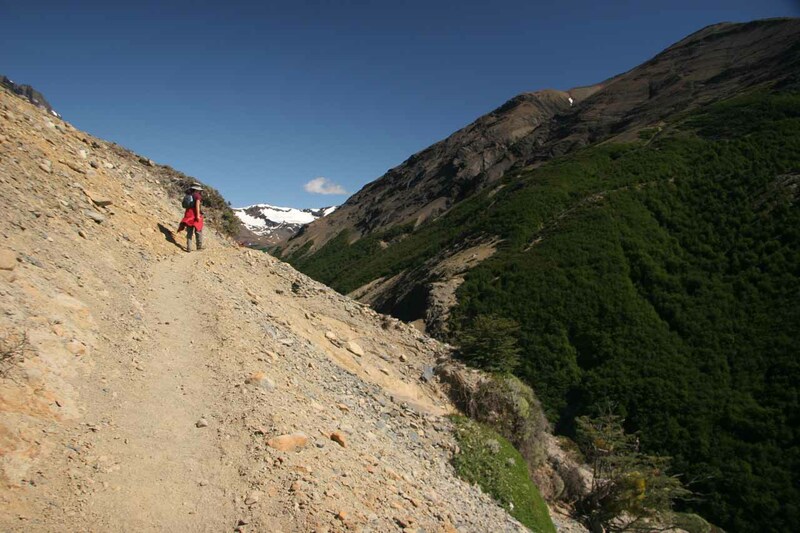 And, not surprisingly, it sounded like the hike was long and grueling, and I started to get the sense it might even be harder than the Laguna de Los Tres hike we had just done three days ago. 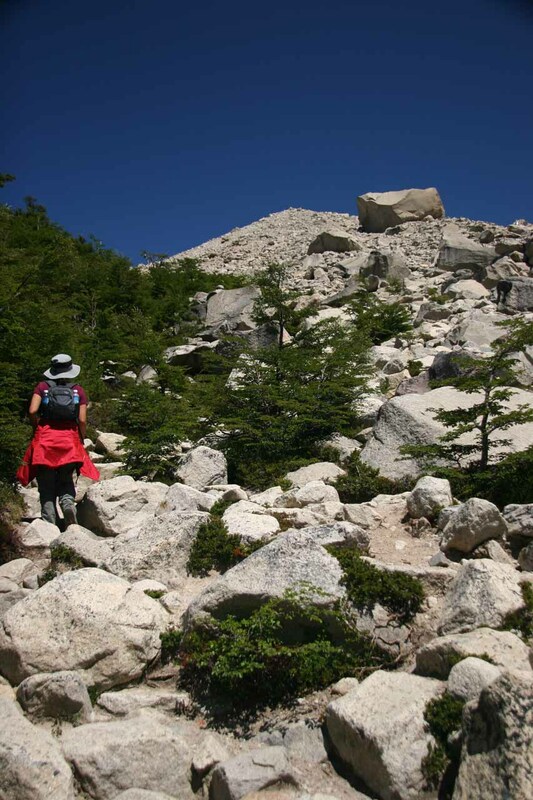 In fact, that German couple didn’t even make it to the destination as the last section of the trail over a steep jumble of boulders was what did them in. Eventually, the topic shifted to other random things like George Bush, Arnold Schwarzenegger (Germans that I meet always seem fascinated by this when they hear I’m from California), Africa, New Zealand, Australia, etc. etc. Such are the characteristics of a good conversation when you can switch from topic to topic and still retain interest in everything being said. Though I did jokingly tell the Dutch couple not to complain to an American about having only 24 days of vacation. Ah yes, it’s times like this where I really relish traveling and meeting people from different parts of the world. Where else can you share travel stories as well as discuss things like politics, other travel destinations, learn about other cultures, etc. all with like-minded individuals who are out here for essentially the same reason as we were? Sometimes I’m amazed at our similarities regardless of who we are or where we come from; at least when we allow ourselves to pursue travel and a life of learning while expanding our horizons. We awoke at 6:30am and ate a pretty average breakfast at 7:15am. At least they let us toast the bread (actually they grill the bread to toast it) and made some scrambled eggs. It’s the kind of pick-me-up we needed to have energy for our hike today – an anticipated 9-hour hike to the base of Torres del Paine. 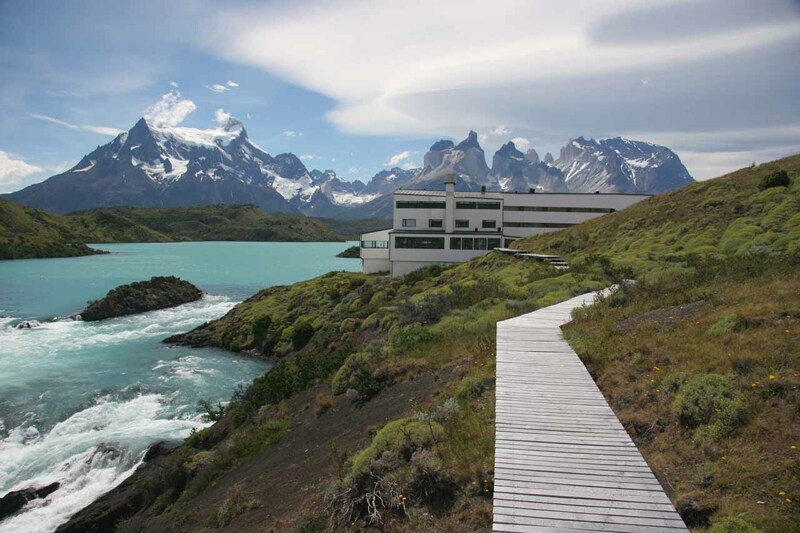 The view of Cuernos del Paine from our spot in the dining hall was also quite pleasing. 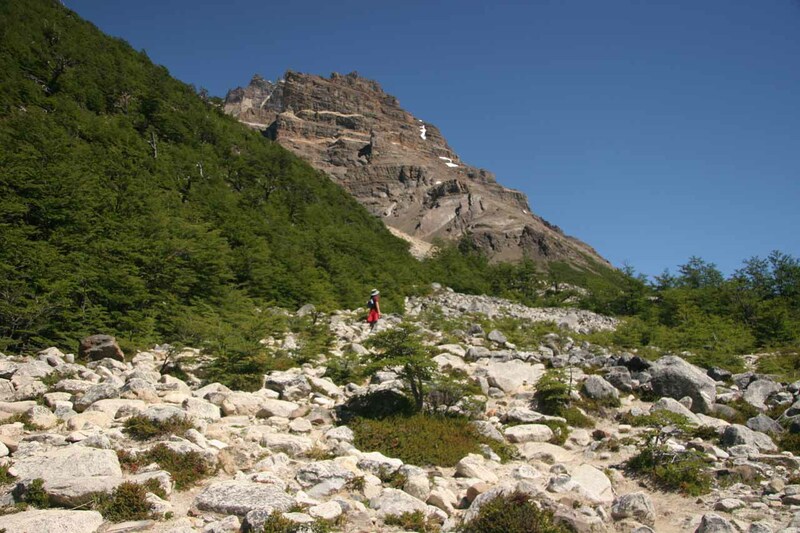 We knew today was an excellent day to go hiking as there wasn’t a cloud in the sky above the Paine Massif. We also saw the Dutch couple from last night, in which case Julie introduced herself. It looked like they were also doing the same hike today. Perhaps we might see them on the trail? 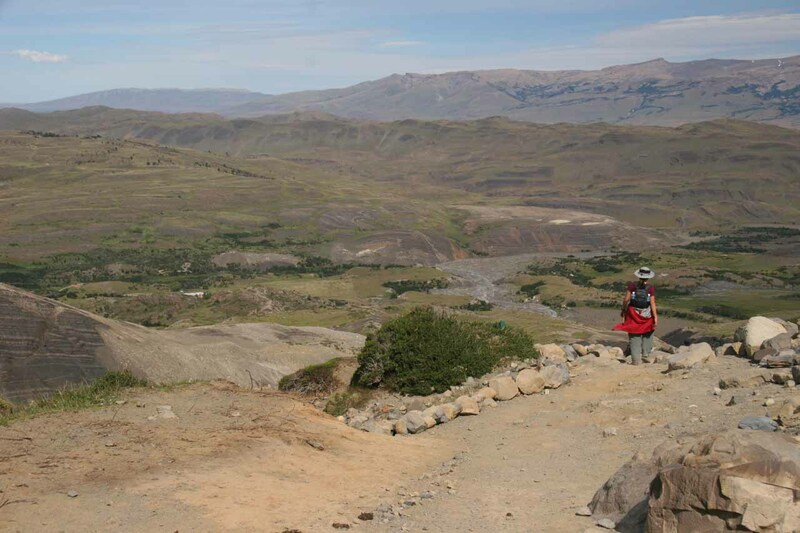 After picking up our boxed lunch, which we had booked yesterday, we headed into the truck and wasted no further time in getting to the trailhead for the Mirador de las Torres hike at Hostería Las Torres. We left at around 8am. 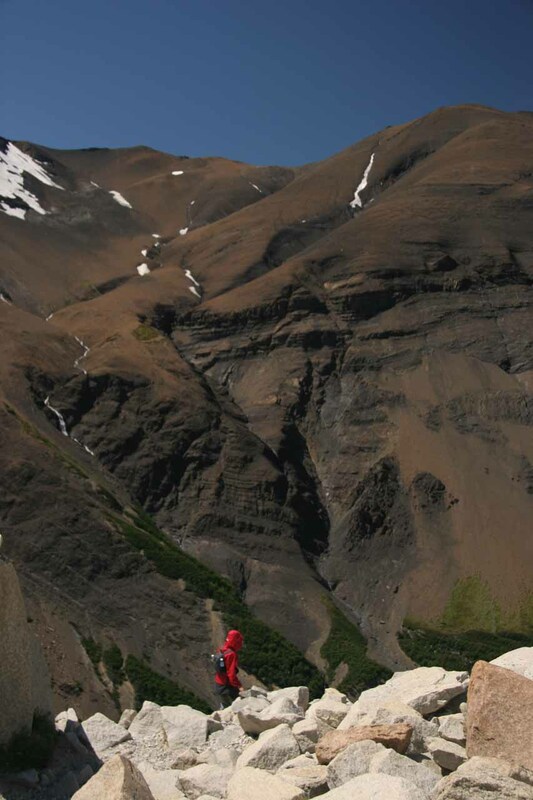 We had to make haste because we knew the trail wouldn’t be easy and we wanted to give ourselves the maximum amount of time to do it at a pace that wasn’t rushed nor conducive to injury. However, we did have a few stops along the way. The first was the park boundary. Since our accommodation was outside the park boundary, we had to re-enter the park and show that we had paid our parks admission. 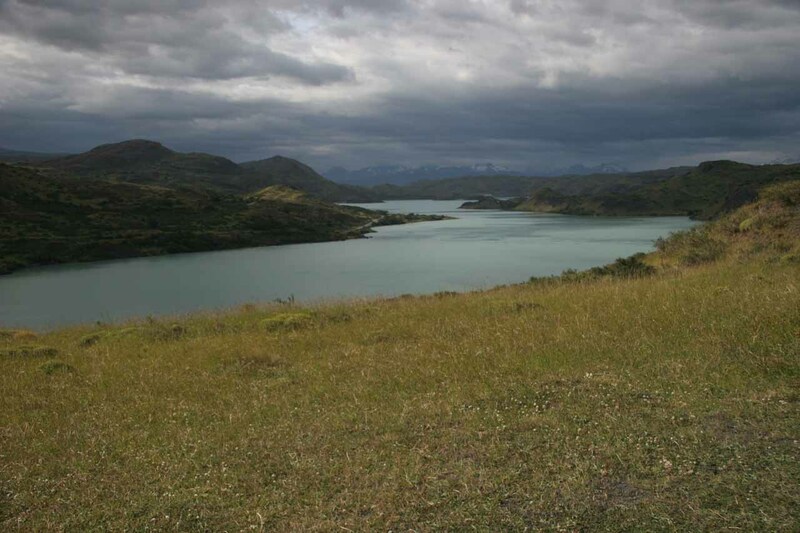 Then, we made a brief stop at a spot overlooking both Hostería Lago Pehoé and Lago Pehoé itself. With the pleasing morning light, it was very scenic. The only bad thing was the shadows. We bypassed photographing Salto Grande in the pleasant morning light, which in hindsight was a mistake not to stop that moment. 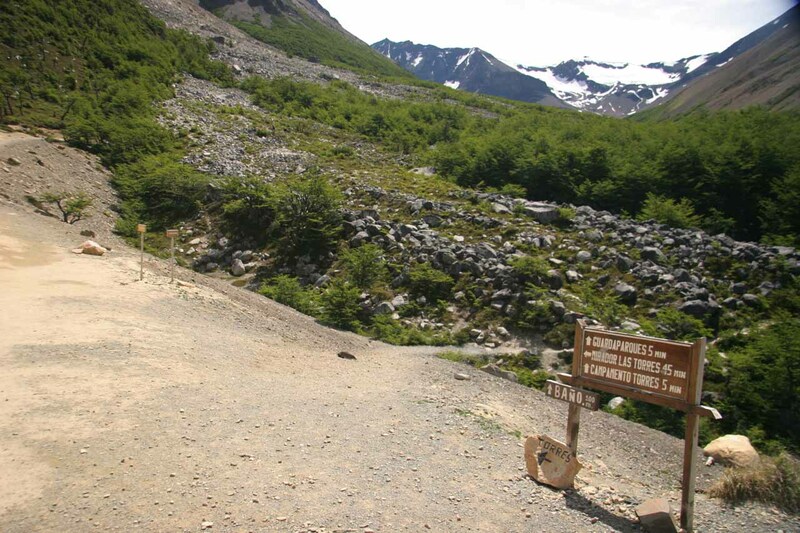 In any case, we got all the way back to the park entrance on the Torres del Paine side and then took the road that led downhill towards some narrow bridges bypassing the Río Paine. 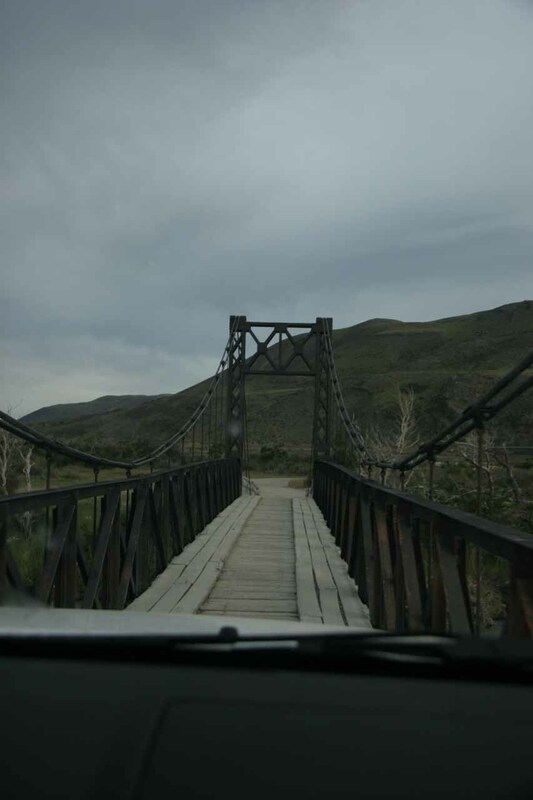 I couldn’t believe how rickety and narrow the second bridge was. We actually had to fold our side mirrors in to pass that one. After the bridge, there was still a little further we had to drive. There were numerous deep potholes on the road to our destination, and I kept wondering to myself why things are so expensive here yet the infrastructure seemed to be lacking. Perhaps the remoteness of the park made it expensive to ship things here, I thought. In any case, we finally arrived at the bustling Hostería Las Torres. By now, it was about 9:15am. After a brief stop in the bathroom at the lobby of the hostería, Julie and I got our stuff together and proceeded onto the trek. With numerous hikers both behind and ahead of us, we knew it was going to be a busy hike, but at least there wouldn’t be a chance of getting lost. 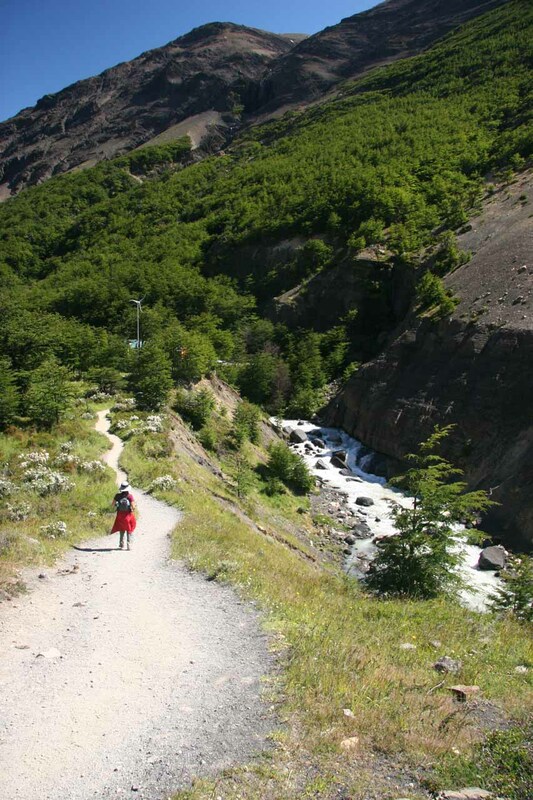 Soon after the trail crossed a bridge over the Río Ascensio, the trail started climbing. 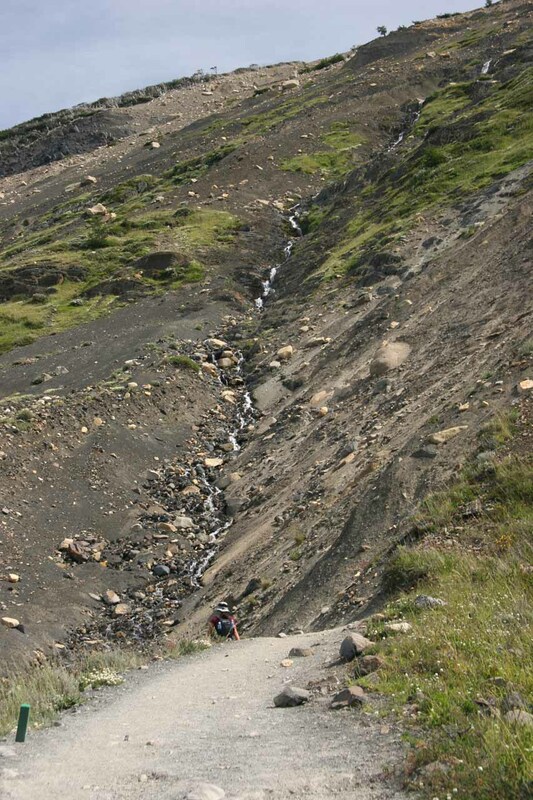 In fact, the trail would climb relentlessly for what seemed like forever. Given the fact that today was a sunny day and there was hardly any wind, we were immediately sweaty with frequent water breaks. Indeed we could hear it. 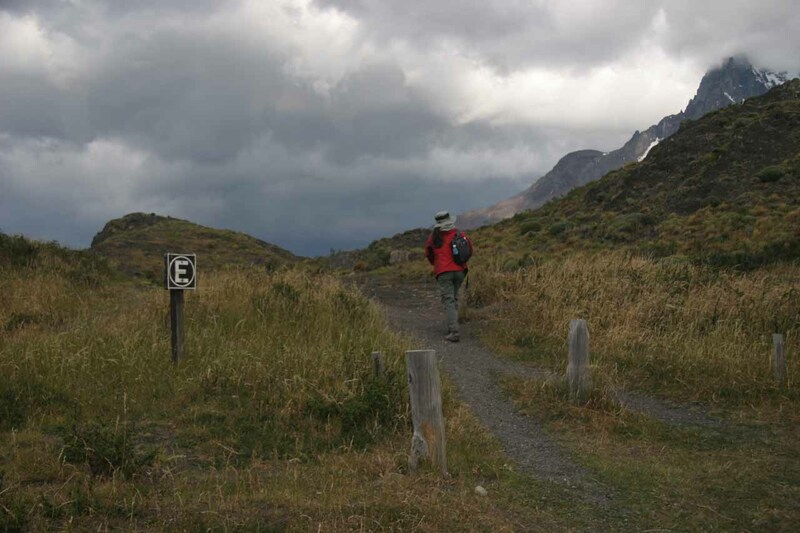 There was faint thundering even from our distant position on the trail. Then it was accompanied by a sudden rush of white with rumbling sounds echoing from the slide. 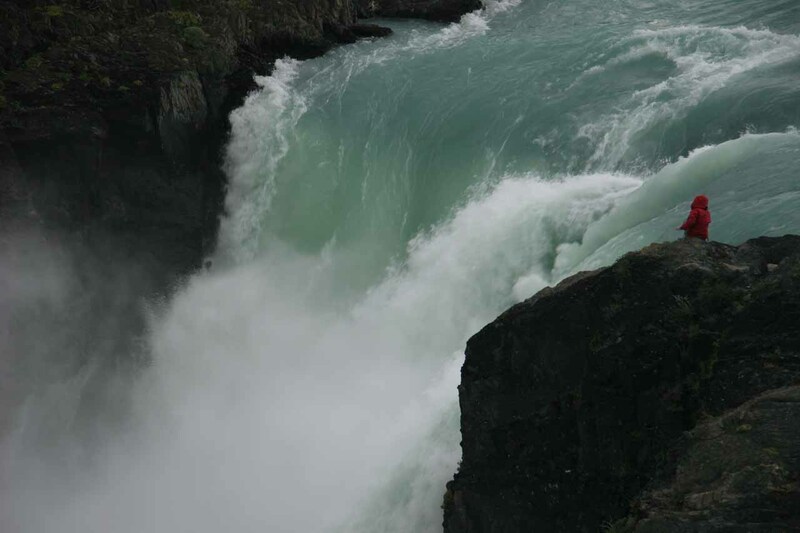 Finally, the rush would diminish and leave a smaller streak of white trickling in its wake. I don’t think we’ve ever witnessed an avalanche in person before (even if it isn’t as massive and those we’re used to seeing on TV). But it was kind of cool to see Mother Nature at work. After passing a trail junction (which joined with a trail that hikers doing the “W” from the west were coming from), the trail climbed a few more minutes before finally reaching the apex. 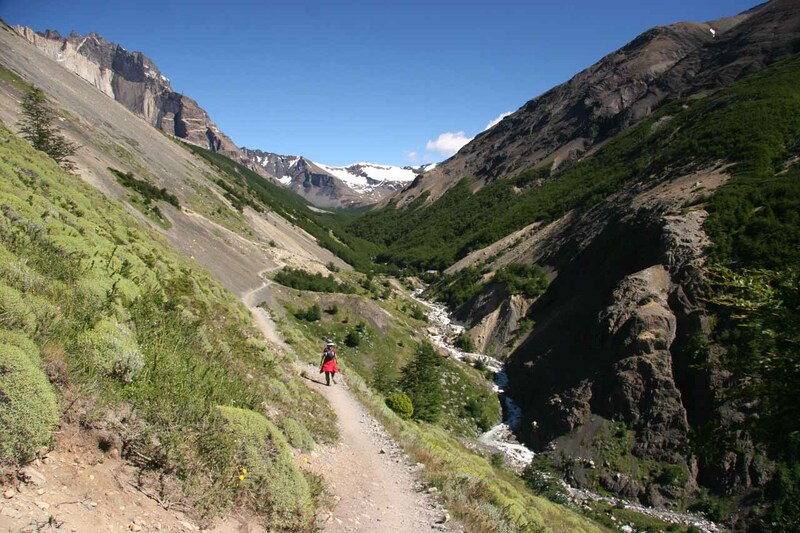 At that point, we caught our first glimpse of the V-shaped canyon sliced by the Río Ascensio and the trail hugging the steep slopes of the canyon. We could tell at this point that the trail was undulating. 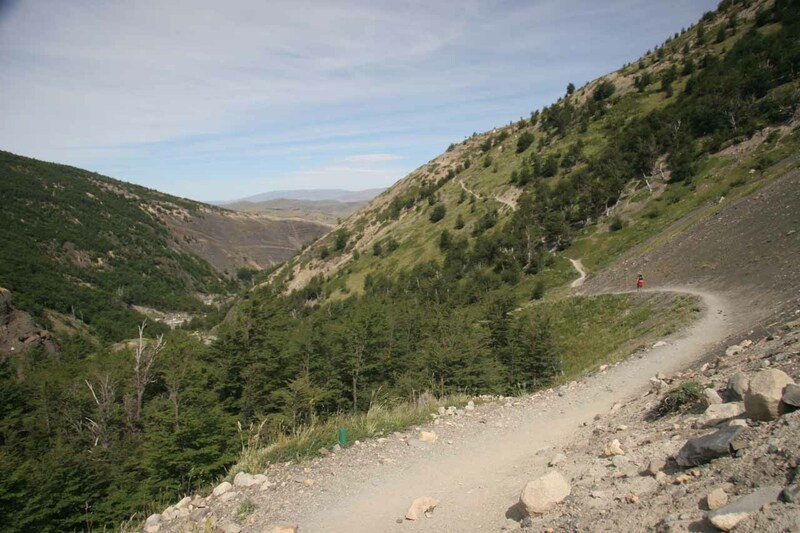 And with each downhill section we’re going through now, we knew it would be a painful uphill stretch on the way back. Nonetheless, we proceeded. The trail narrowed considerably in many places along this stretch. Some parts were actually badly worn with some moderate exposure to the slope dropping around 200m into the river below. 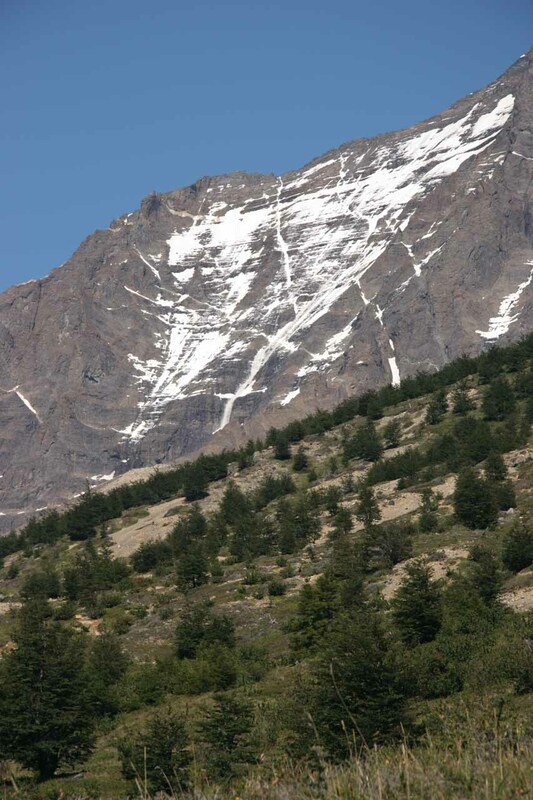 Some sandy traverses in the trail indicated how avalanches or landslides must be frequent here during winter and early spring. Fortunately for us, most of the snow are only at the highest elevations as we had passed the summer solstice a few days ago. At 11am, we finally reached a developed refugio called Alb. El Chileno (I have no idea what the Alb. stands for) with its neighboring windmill and picnic tables. Instead of crossing the bridge over the river to get to the shelter, we pressed on as the trail now hugged the river. 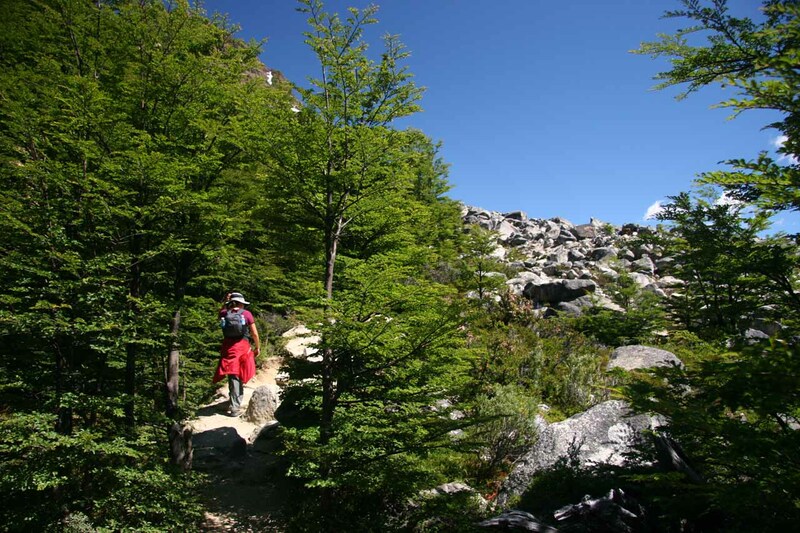 The trail continued to undulate up and down with a net elevation gain as it passed through a grove of seemingly alpine trees. 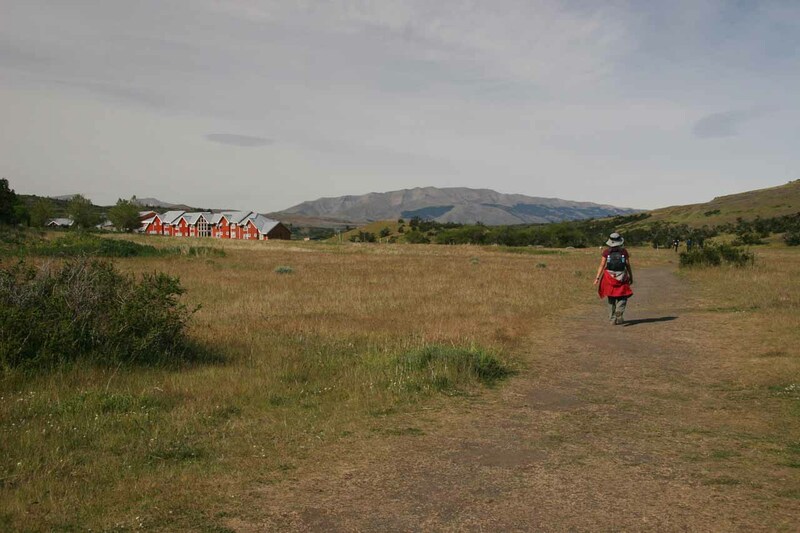 It provided some moderate relief from the hot day with little wind, which seemed foreign to us as our Patagonian experience thus far had some episode of strong winds every day. Finally at about 12:15pm, we bypassed a trail junction and started to ascend some boulders. “So this must be what that German lady was talking about yesterday,” I told Julie as I knew from German couple’s description last night about this last section of trail. 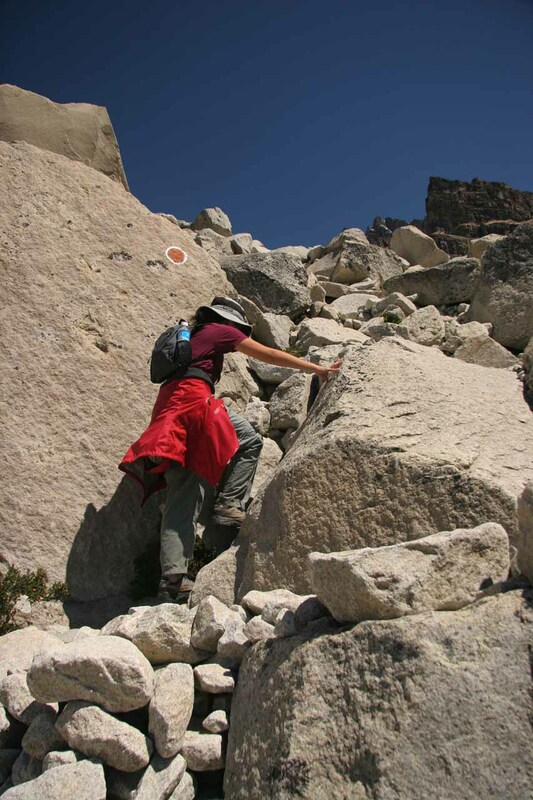 At first, it didn’t seem all that bad as the trail was pretty easy to follow with the orange dots painted onto strategic boulders and the relative lack of steepness. The trail then started to get steeper. Having already hiked nearly 3 hours to even get here, we decided to take a break and have our boxed lunch within the shade of some sheltering trees just before the trail climbed further up past their end. We consumed the rather ordinary roast beef sandwich with plenty of water to wash it down and a few pieces of chocolate. All the while, we were also watching other hikers struggling to make their way both up and down this bouldery section. We noted where they were going so we knew where the trail continued next. Refreshed and ready to go, we got up and proceeded to join the masses and climb up the jumble of large boulders. It didn’t take long before the “trail” revealed the climb that was before us. Sure enough the pile of boulders seemed unending as it appeared to touch the deep blue cloudless sky. There was a huge boulder way up near the top and that looked like the landmark we could use as our guide if we every missed any orange dots. Indeed, the going was slow as the “trail” got increasingly steeper. It got to the point where we were using our hands as much as our feet to climb boulder after boulder. To our relief, there was some light breezes starting to come in to cool us down somewhat. There was even a curious condor hovering over all of us perhaps wondering out why there’s all those tiny two-legged creatures down below moving around the jumble of boulders. 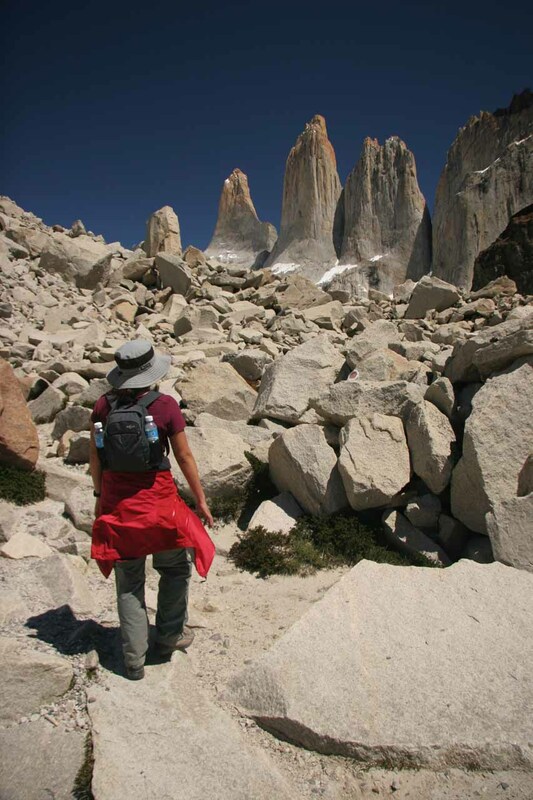 After nearly an hour of climbing since our lunch break, we bouldering persisted, but after being assured by some American hikers making their way down that there was only five minutes to go, we started to see the signature towers (torres) rising above the boulders. Within a few more minutes, we finally arrived at our destination. 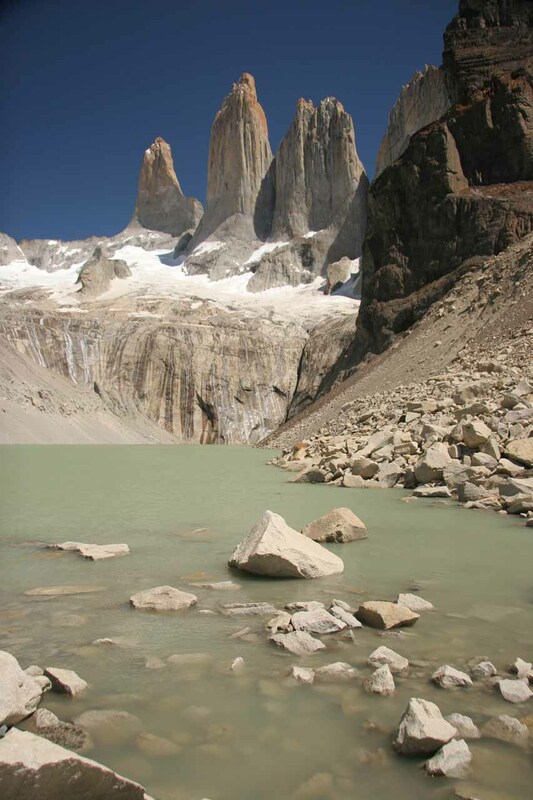 Under the deep blue skies, the towers rising over a mix of glacier and snowfields producing streaks on the walls at its base feeding a clear greenish lagoon further below was truly a sight to behold. Plenty of other hikers made it here before us as they were strewn about the perimeter of the bouldery amphitheater soaking in the scenery while resting their tired bodies. There was even a guy flying a kite in the wind on the shore of the lagoon below. As Julie was resting, I took this time to get to the shore of the lagoon to take even more photographs. I could only imagine what a scene this must be if you camped before the boulder section and got up here in time for sunrise in good weather. I guess I’ll have to leave that up to the backpackers who had the presence of mind and good fortune to capture that and publish it for the rest of us. 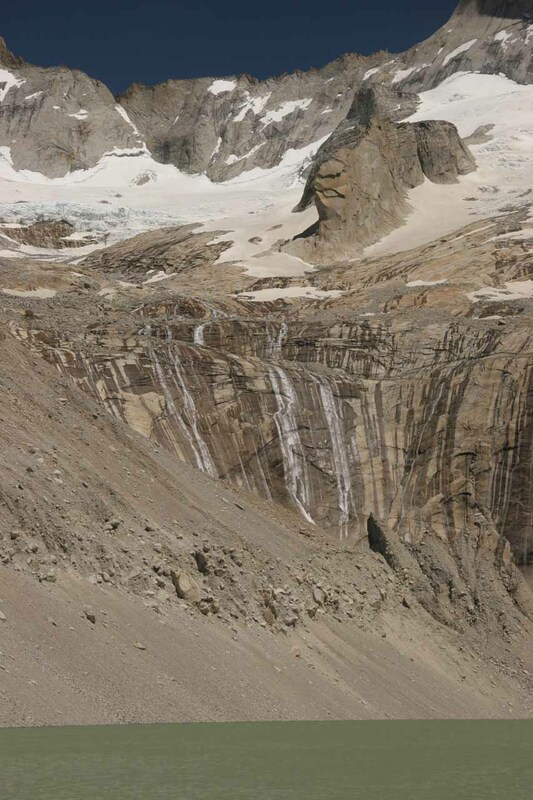 Especially alluring were these cascades streaking down the granite wall beneath the towers and the feeding glaciers. 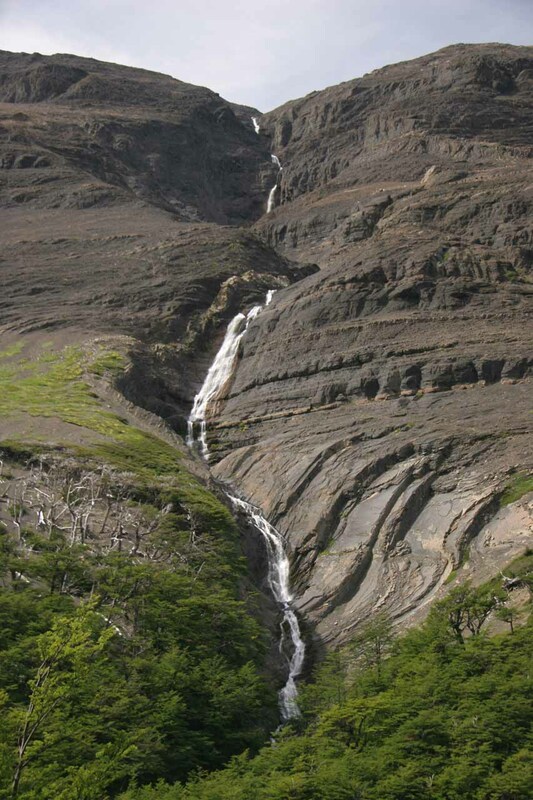 I don’t know if these count as waterfalls, but they sure were something you don’t see everyday. The winds started to pick up again, but they were nowhere near as strong as what we had experienced on each day of this trip. We lingered here for about an hour to give ourselves a chance to get those obligatory we-were-here photographs with the help of other people willing to snap the photos for us. But by 2:30pm, it was time to start heading back. And so we pried ourselves away from the divine scenery and made our way down the jumble of boulders. The going wasn’t easy as there were plenty of stretches where it was better to sit and scoot than to try to nimbly hop and tip toe down boulders (slick with loose gravel on them) and risk a nasty spill. Still, we found ourselves going down much faster than we did going up. But it was jarring to both our feet and our knees so we couldn’t wait to return to a more foregiving part of the trail back amongst the trees. While it was a momentary relief to return to the trees and leave the boulders behind, there was still a ways to go to even return to the Alb. El Chileno refugio. At least the path is mostly downhill with some minor uphills. 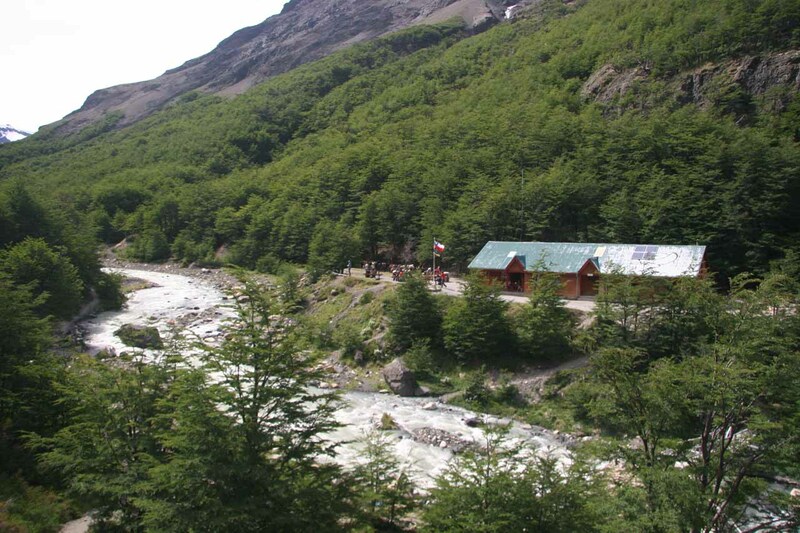 By 4:30pm, we returned to the familiar windmill and refugio by the river. 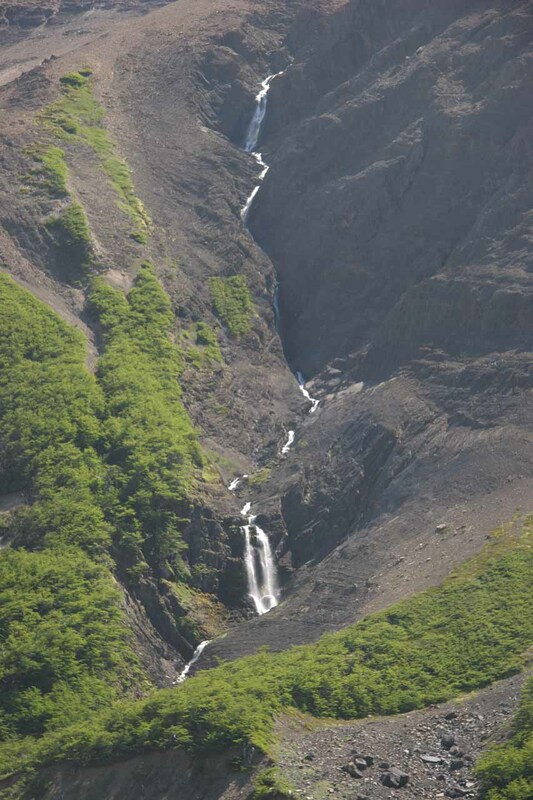 But not before catching a nice view of a cascade not too far upstream from the refugio. Somehow we missed this view on the way up, but with the better afternoon lighting, we didn’t miss it on this go around. After the refugio, there was one last bit of strenuous hiking left. As anticipated earlier this morning, there were some significant painfully uphill stretches up ahead (parts that were previously downhill on the way in). Indeed, here it was before us. Lots of slow, uphill hiking. 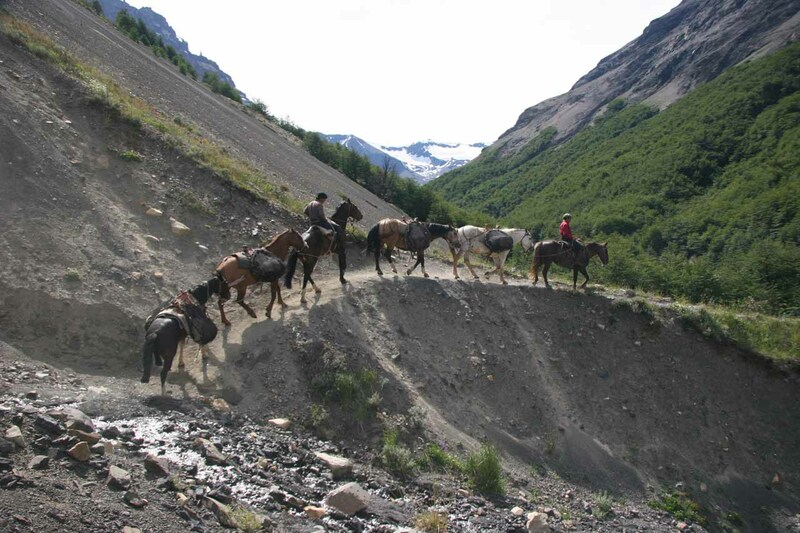 There were also horse trains carrying supplies going the other way on the narrow, exposed trail to break our momentum. Yet the horses didn’t seem to hesitate one bit while traversing the narrow paths with dropoffs. They seemed quite used to the terrain. In any case, we knew this was the last significant stretch of uphill hiking before it was all downhill to the hostería. And given our tired bodies at this point, that downhill stretch couldn’t come soon enough! As we slowly made our way back up on this difficult stretch, we noticed that light clouds had all of the sudden started to overtake us. So much for the cloudless sky, we thought. Regardless, we got our picture perfect weather and who cares about what happens with the skies at this point? My knees were really feeling sore at this point. They were already sore at the boulders, but now it got to the point where they’d hurt depending on how I landed on each step and how far each knee had to bend. After finally reaching the apex of the last climb, we reached the anticipated downhill. 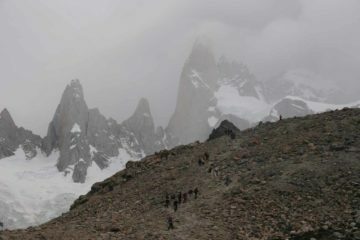 There was the Hostería Las Torres looking tiny out in the distance, but at least the destination was in sight. A sign at the junction with the rest of the “W” trail said there was still 90 minutes to go, but somehow I had the feeling we’d be back in much shorter time than that. So as Julie slowly made her way down, I alternated between trail running (pretending to be like a bighorn sheep running downhill) and waiting for Julie. 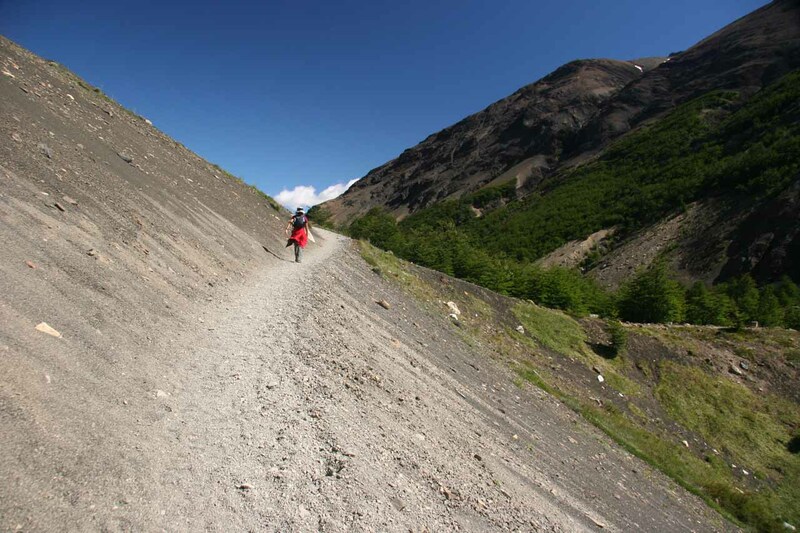 The trail running was confined to the steepest downhills, which were actually quite frequent. Still, my knees didn’t like the pounding from going downhill so my pain tolerance was being tested. There were some steps that I took where I had to straighten my leg as I walked to avoid more pain to my knees. Finally, at the bottom of the downhill, the trail flattened out for what seemed like the first time in several hours. 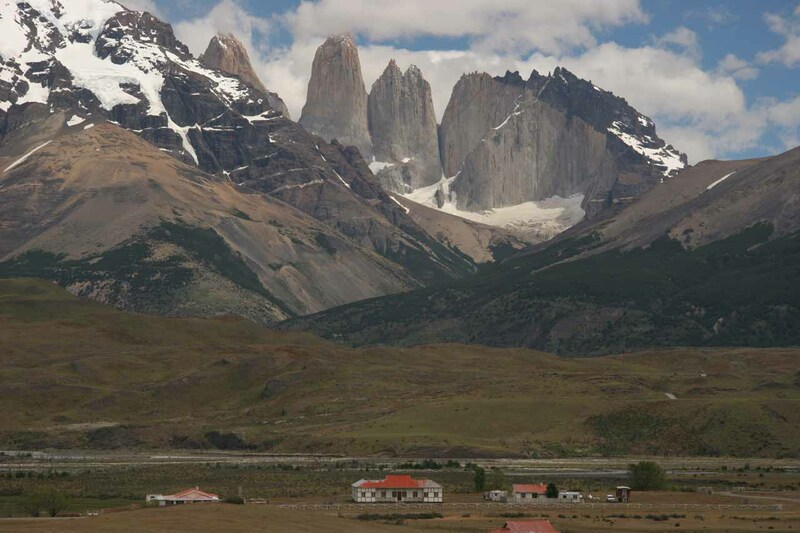 There was one more short uphill stretch past the bridge over Río Ascensio (funny how you start noticing even the minor hills when you’re tired), but just beyond that, the Hostería Las Torres was mercifully before us. By 5:45pm, we finally returned to the car, where we put away our packs but kept the camera so Julie could take more photos of the hostería in her own little informal visit for her work. Dinner wouldn’t be until 7:30pm so we killed time just lounging around in the lobby of the hostería. It was actually quite hot in there as the glass ceilings and windows turned the lobby into a greenhouse. As we walked around towards the restaurant, which was a few paces outside the main lobby area several buildings down to the north, we noticed a resting Dutch couple on the grass area. After recognizing the faces, we realized that it was the Dutch couple I was conversing with last night. They relayed their disappointment to me that they didn’t make it far past the Alb. El Chileno. I could tell they probably thought it wasn’t worth it because you don’t see the towers until the very end. 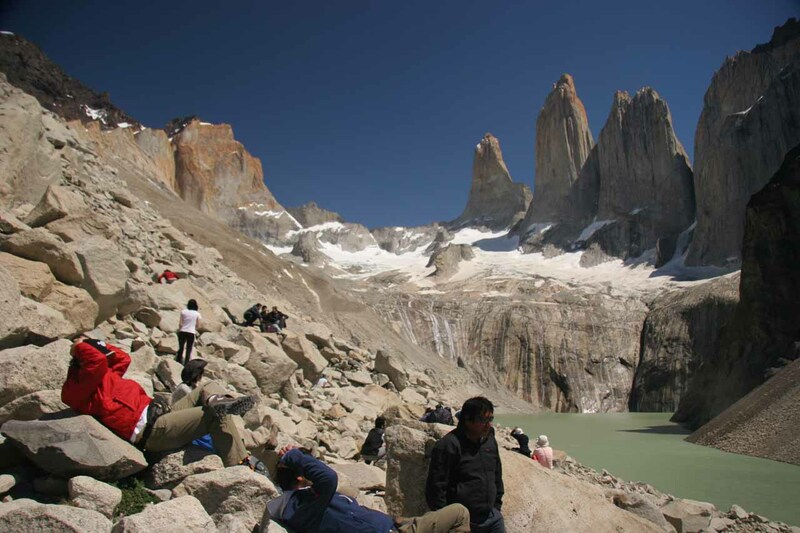 In any case, they were waiting for their shuttle back to the Hostería Lago Tyndall. Since we self drove, we could at least enjoy a dinner here before returning. The Dutch couple smiled and waved at us. They had that look of understanding when they saw me wince in pain as I limped my way towards the restaurant with Julie. And so at 7pm, we had ourselves some pre-dinner drinks. Julie had an expensive Coke, while I tried something different – a Calafate Sour. Considering we had Chile’s national drink, the Pisco Sour, during last night’s Christmas Eve buffet, I thought we’d try something along those lines. It was delicious but not as sweet as the cocktails we’re used to having (we never were wine connoiseurs nor were we into alcohol in general). Finally at 7:30pm, they let us order from the menu in lieu of yet another dinner buffet. And so that was what we did. I had myself a delicious rack of lamb chops while Julie had another fish dish. The food was quite well prepared though we knew we’re paying around $70 USD for all of this (plus the drinks). So yeah it was a pain in the wallet, but we had to reward ourselves for such a painful Christmas day. It was about 8:45pm when we left the hostería and made the uneventful, nearly 90-minute drive back to our accommodation. By now, the clouds were overcast so there wouldn’t be another chance at any alpenglow shots last last night. But that was fine. Just one less thing to occupy us when our thoughts were on a hot shower and a bed. When we returned to the accommodation, the fuel tank was now around 2/3 tank. I reckoned it was still not enough fuel to make me comfortable about having some more driving to do the next two days without being able to fill up. Inside our humble room, the shower was still warm, but not quite as warm as yesterday. I guess it was better than nothing. We didn’t have to wake up early on this day since yesterday we endured a long nearly 9-hour up-and-down hike. So we allowed ourselves to sleep in a little (until 7am) and have the usual breakfast. 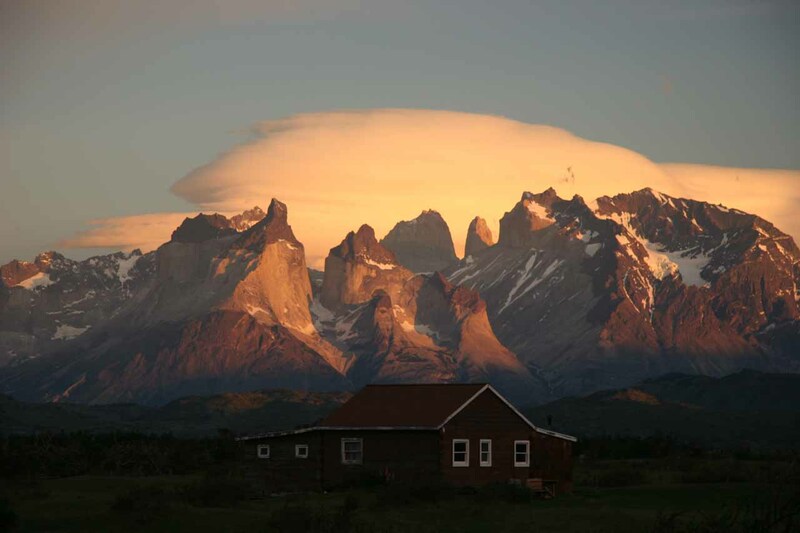 This morning, clouds dominated the scene and many of the tops of the Cuernos del Paine were obscured. So much for the morning light shots of Salto Grande, I thought to myself. 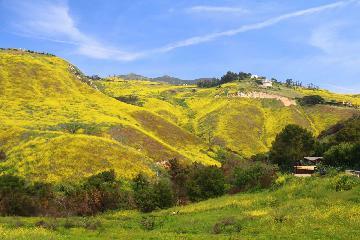 At the same time, both Julie and I were glad we had the opportunity to do the big hike yesterday instead of today. 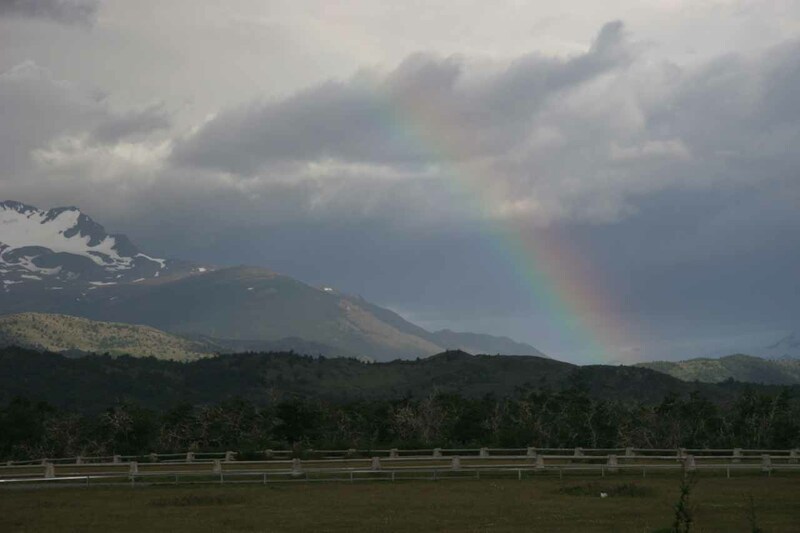 So by 8am, we got into the truck, got a glimpse of a rainbow (so we knew it was going to be a gloomier day), and we headed out again. But instead of driving for 90 minutes to Hostería Las Torres, we only had to drive a little less than an hour to the trailhead of Salto Grande. This was the prime waterfall attraction of the park so we really looked forward to it. 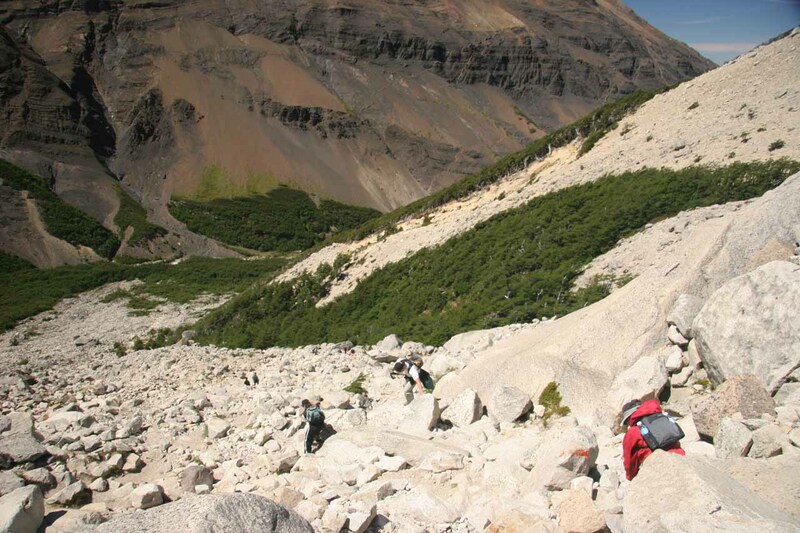 I also planned to add an additional 90 minutes to the 30-minute return hike to the Mirador de Los Cuernos. But since we could tell the top of the horns were obscured, I doubted that effort would’ve been worth it. So by 9am, we were at the unsealed car park, which was just a few minutes past the more developed car park for the catamaran across Lake Pehoé. We were the first ones there so we enjoyed the relative solitude and took our time hiking. The winds came back a little stronger than yesterday, and we both had to wear our light jackets since it was certainly much colder than yesterday. The dark clouds around us certainly hinted that we might even get rained on. Anyways, we were at our first glimpse of Salto Grande by 9:20am. 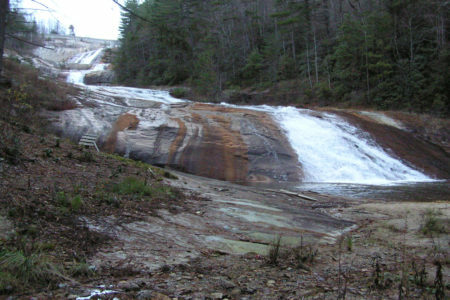 We could already hear the powerful falls before even getting to the overlook. There was some sun breaking through the ominously dark clouds, which somehow seemed to have amplified the threatening effect of those clouds. 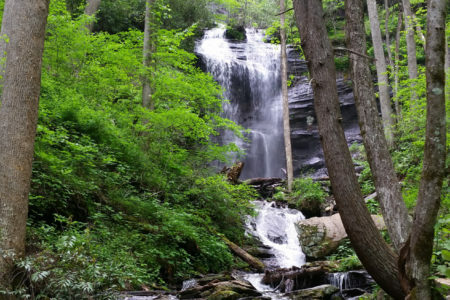 Since I had brought the light Giotto tripod along for this short hike, I was finally able to take long exposure shots of the falls without worrying about improvising. 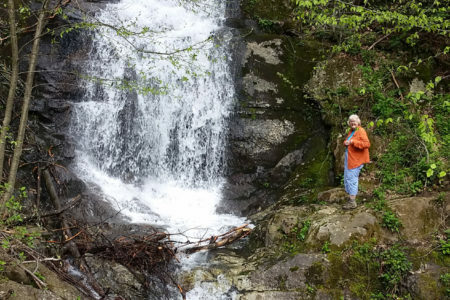 Julie voluntarily walked towards the brink of the falls along the established trail so she could serve to provide scale in my photograph. Of course I was always a little nervous about getting close to waterfalls of this size so I took photos of Julie and the falls with a few butterflies in my stomach. 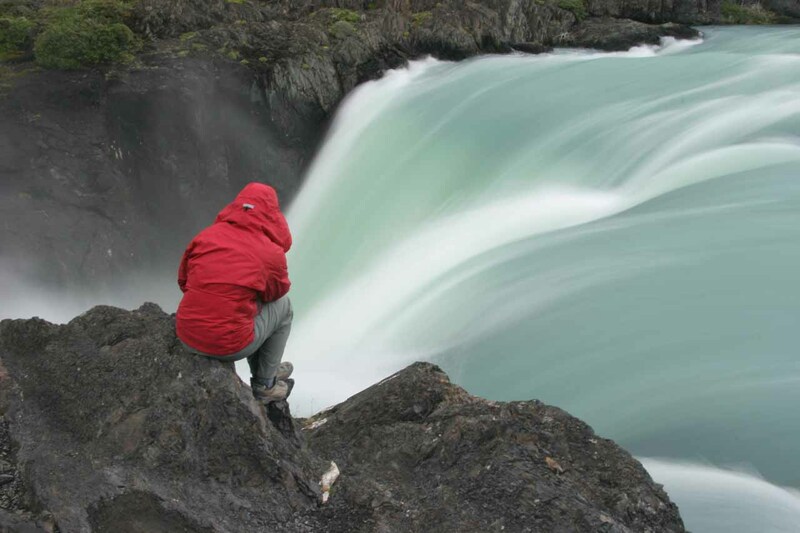 A few minutes later, I rejoined Julie and we took a few more photographs from the brink of the falls – all the while making use of the tripod. By 10:15am, we were on our way out. Clouds still obscured the looming Cuernos behind us so I abandoned any hope of extending this hike to the nearby mirador. Plus, other people started to trickle in. As we walked out, there was a large group going the other way. That could only mean one thing – a tour bus! Clearly, I could see why this attraction was popular since it was one of the easiest hikes to do in the park. We were back at the car a little after 10:30am. As we drove back towards the perimeter of the park, there were lots of cars going back the other way. I guess this was when the park really starts to get busy with shuttles and self-drivers, I thought. 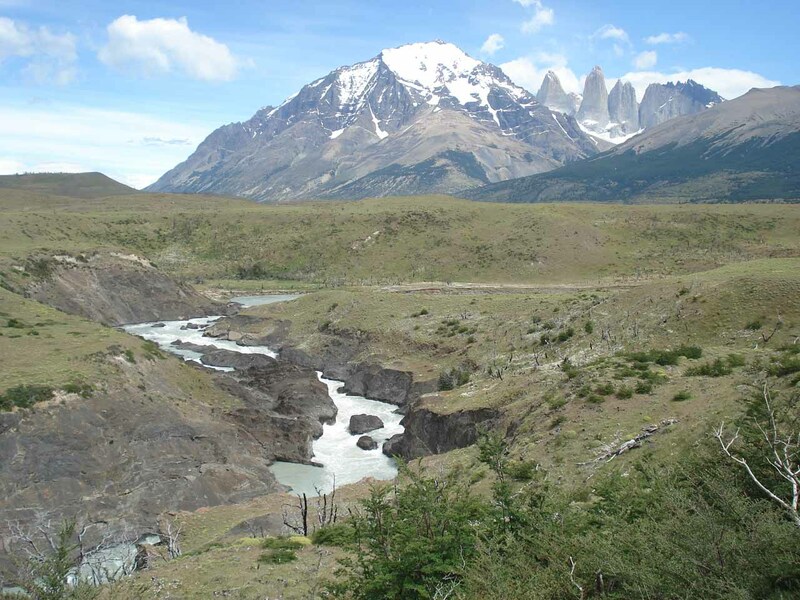 Anyways, the last region we had planned to see in the park was Lago Grey and the Grey Glacier. 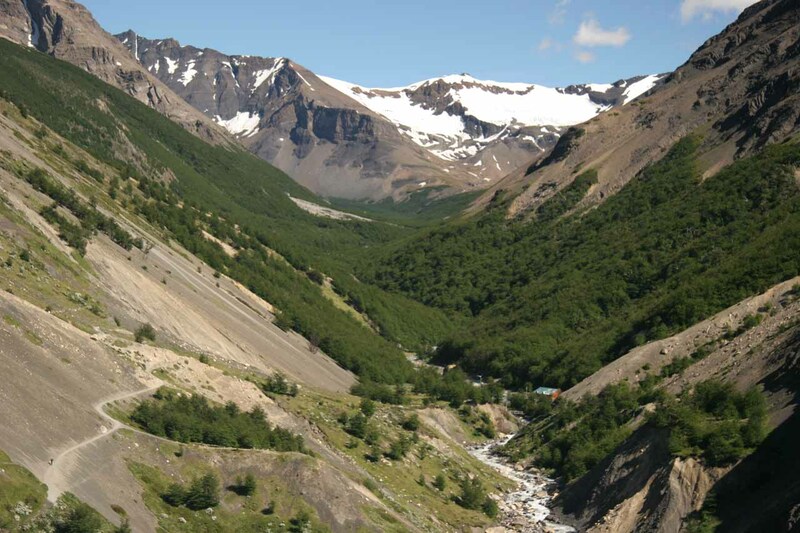 It was on the way back out to Río Serrano, but we had to make a turn and drive another 30km or so all the way to the Hostería Lago Grey. We arrived at the accommodation at around 11:15am. The sun was partially breaking through the dark clouds and the wind hadn’t really picked up upon our arrival (or so it seemed) as midges were annoying and even got in a bite or two. Of course just as I had gotten used to the relative stillness, the winds picked up again. Well at least, they’d be blowing away the midges. Inside the hostería, Julie hoped to go onto one of the glacier tours, but they were fully booked for all the early day tours. The only opening was for 6pm for the 3-hour tour. 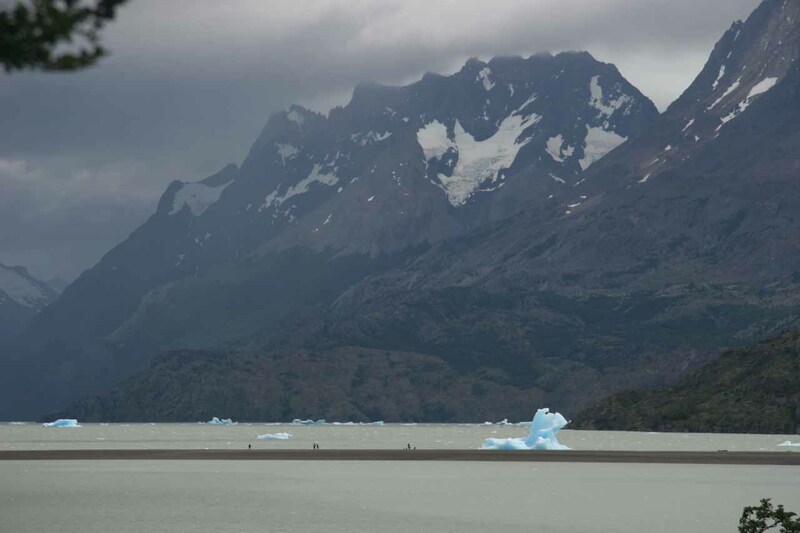 We went ahead and put in our name, but I wasn’t sure about killing so many hours in one place just for a glacier boat tour – especially after having seen the Perito Moreno Glacier, which we were able to see by foot and not by boat. In any case, we enjoyed a quick sandwich lunch and expensive drinks. It was good thing they took credit cards here because we were really low on Chilean Pesos, especially after the hefty admission fee into the park in the first place. 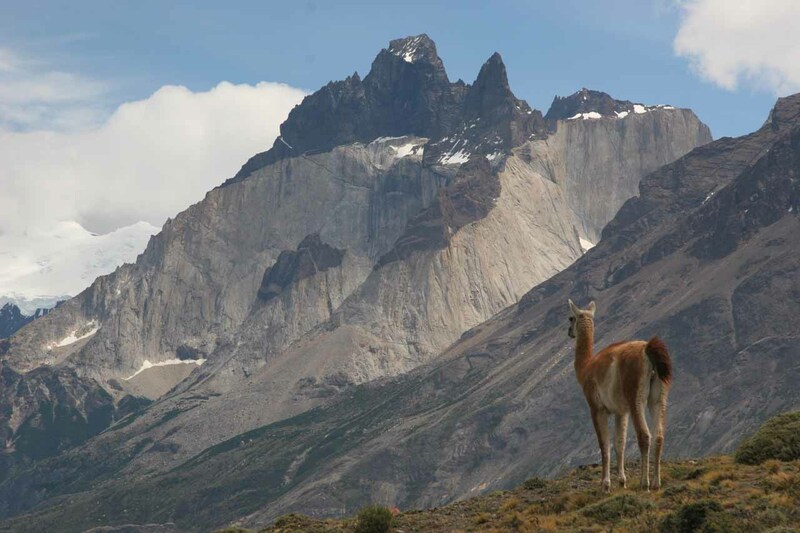 Still, everything was expensive in Torres del Paine and this hostería offered no price relief. As we gazed out at the scenery from the lodge, we could see icebergs drifting before what looked like a peninsula where people were walking across. Way out in the distance beneath the dark clouds and squalls was the Grey Glacier. The mountains backing the lake were impressive even when obscured by clouds. The winds also got more intense. After our quick lunch, we decided to do go out to that peninsula where people were walking. The icebergs looked like you could touch them from where we were at. We had never been close enough to touch a big iceberg so the possibility of doing it on this day was something we couldn’t resist. 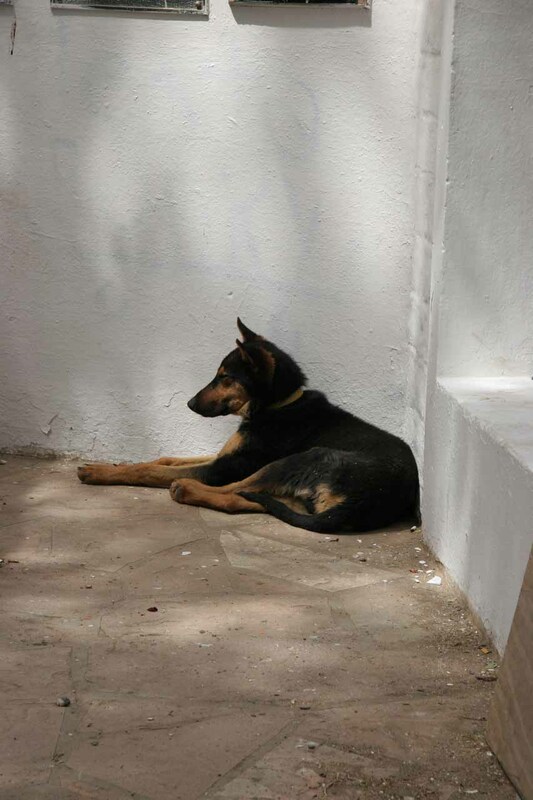 So we got back to our truck and started to head out before a four-legged animal was trotting towards the hostería. Was it another stray dog, we thought? 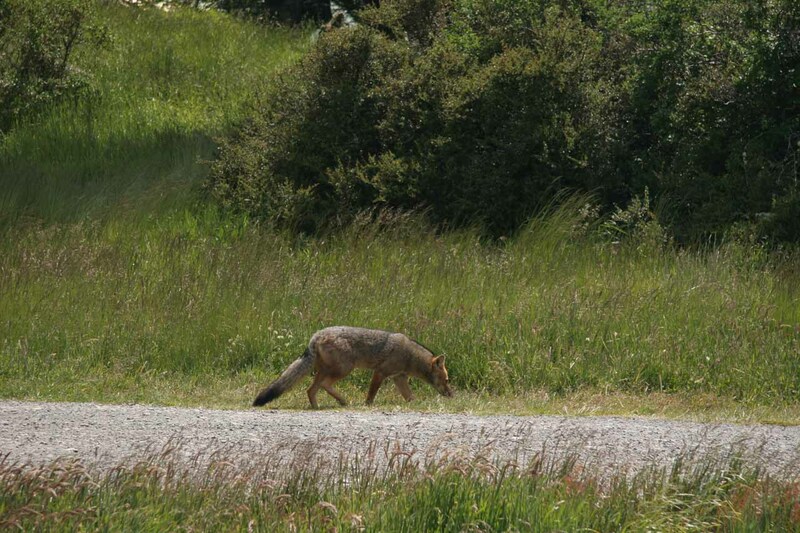 But when it got real close, we all of the sudden realized that it was a fox! Quickly we got my camera and tried to take as many photos of this as we could. By 1:30pm, we got to the trailhead that would get us to the peninsula we sought after. This was the same trailhead for the Pingo-Zapata trail, which was another one of those multi-day treks that we knew we weren’t going to do on this trip. 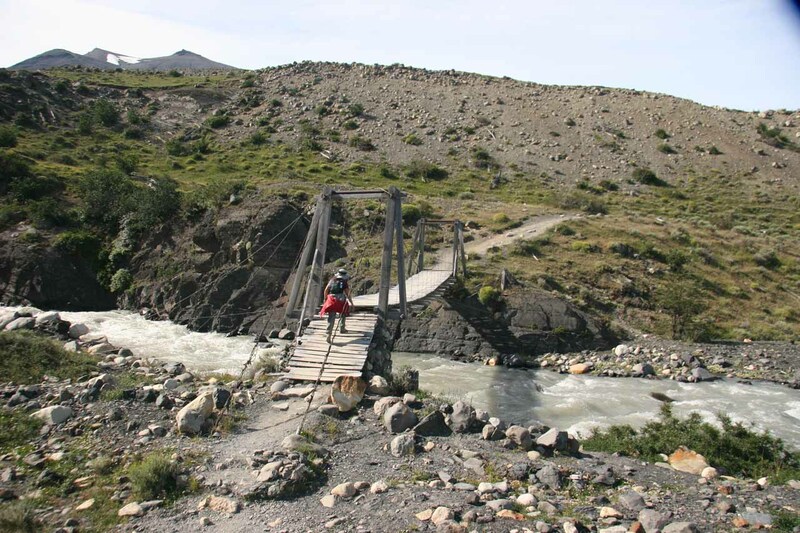 And so we proceeded to walk towards a nearby swing bridge over Río Pingo before going up a hill then down into the gravelly plain left by the Grey Glacier before it retreated many years ago. The winds were really strong by the time we made it to the peninsula. Fortunately for us, the winds were somewhat behind our backs so it pushed us forward. Unfortunately, we’d have to walk against this wind on the way back. Either way, we’d have to deal with pebbles pelting us like beebees again when the gusts got real strong. 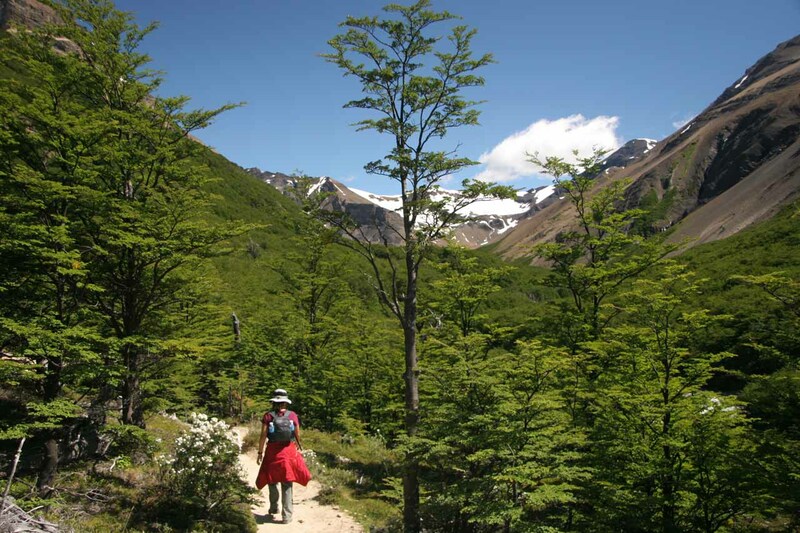 Once again, this reminded us of that day we did the Laguna de Los Tres hike early in the trip. This peninsula seemed a lot longer than it seemed back at the hostería. What’s more, the iceberg we thought was so close was actually a bit further from land. So we wouldn’t be touching it, but Julie did manage to pick up a small piece of ice that did manage drift to the peninsula. 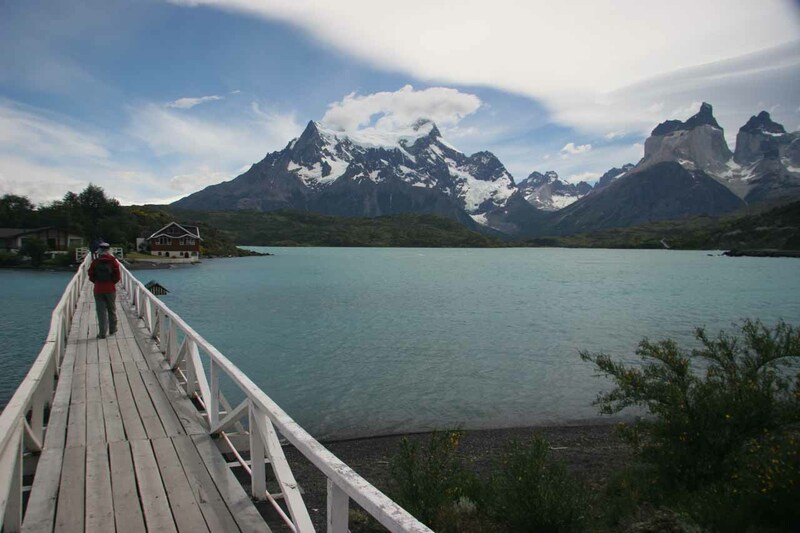 It was too bad the Cuernos del Paine in the distance were still a little obscured by clouds because I could imagine how gorgeous a photo from here would be with the granite peaks along with the lake and the blue icebergs. It was almost 2pm when we got to the far side of the peninsula. We saw there was still more trail on the neighboring island. We thought it was getting late and we figured the mirador at the tip of the island wouldn’t be worth the trouble. The Glacier Grey was still far off in the distance. So back we went against the wind and back towards the lodge. The walk back was actually a lot longer and a lot tougher than we thought. The winds didn’t make it easy and the dark clouds above us made it seem like we’d get rained on. Fortunately for us, it didn’t rain, and by 3pm, we were back at the car park. I was getting tired so we drove back to the Hostería Lago Grey and decided to have a nap in the lobby area. Julie was engaged in a conversation with an elderly couple who were UK ex-pats who moved to Sydney, Australia and lived there for 16 years. By the time I awoke, it was still 4pm. There was still 2 hours to go before our tour. I told Julie I didn’t feel like waiting around for that tour especially since we wouldn’t be back at our lodge in time for dinner until around 9 or 10pm. 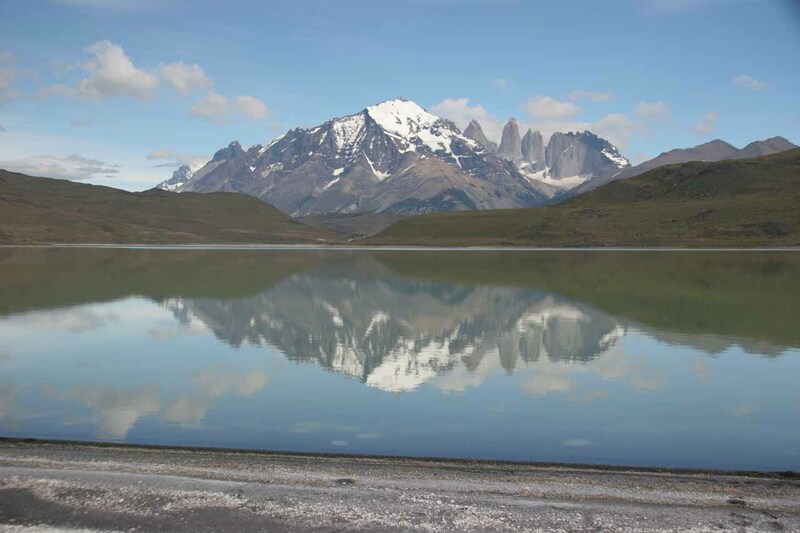 So we cancelled our reservation and headed back to the Hostería Lago Tyndall. Back at the Tyndall, the truck was now at half tank. I figured it was enough fuel to get back to El Calafate though. We spent the rest of the afternoon walking around checking out the other neighboring accommodations like the Hostería Río Serrano and the Hostería Lago del Toro. When dinner time came around at 8pm, we decided to try out the pricey Río Serrano. Once again instead of having a buffet, we ordered from the menu. And finally, Julie got a meal she was satisfied with in terms of the quality of the food. Still, I paid around $70USD for this dinner so I knew it was a pain in the wallet. 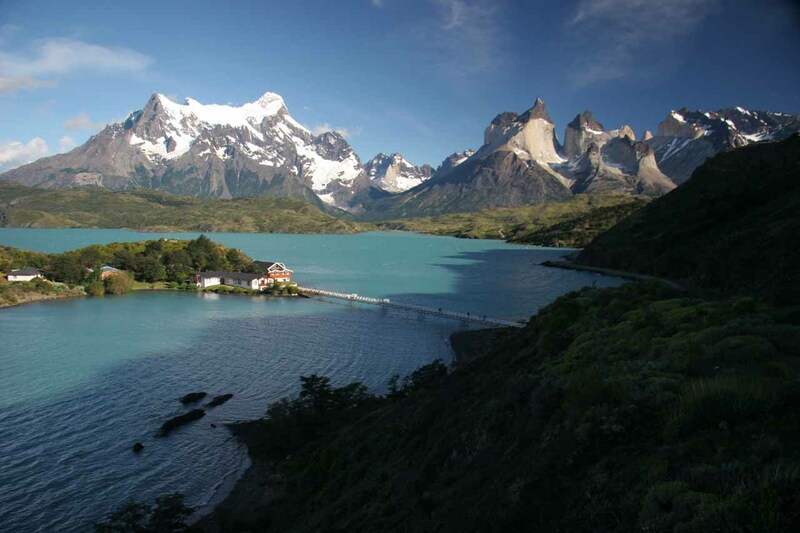 Back at the Hostería Lago Tyndall, it was time to shower, tend to our dental hygiene, and sleep. Unfortunately, for this night, there was no more hot water so we took a cold shower (fortunately not a frigidly cold shower though). Like I said before, this place only met our lowered expectations. But for a place charging $200 USD per night not having hot water? That’s a bit of a rip off in my book. Knowing that today was a day we were going to return to El Calafate and really do nothing else, we thought we could sleep in and have a late breakfast. It was about 8am when we had breakfast. Clouds still dominated the landscape like yesterday so we weren’t motivated to do any more photo runs before leaving the park. After breakfast, we got our stuff into the truck and settled our hotel tab. 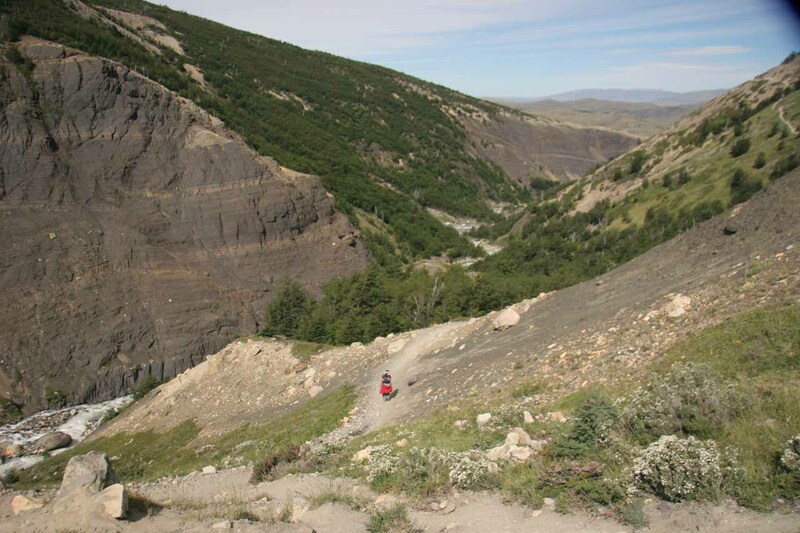 Then, we headed back to El Calafate but this time taking a different road than the way in. Not much was going on during this drive except a bunch of curvy unsealed roads. When we finally got to paved roads, something didn’t seem right. 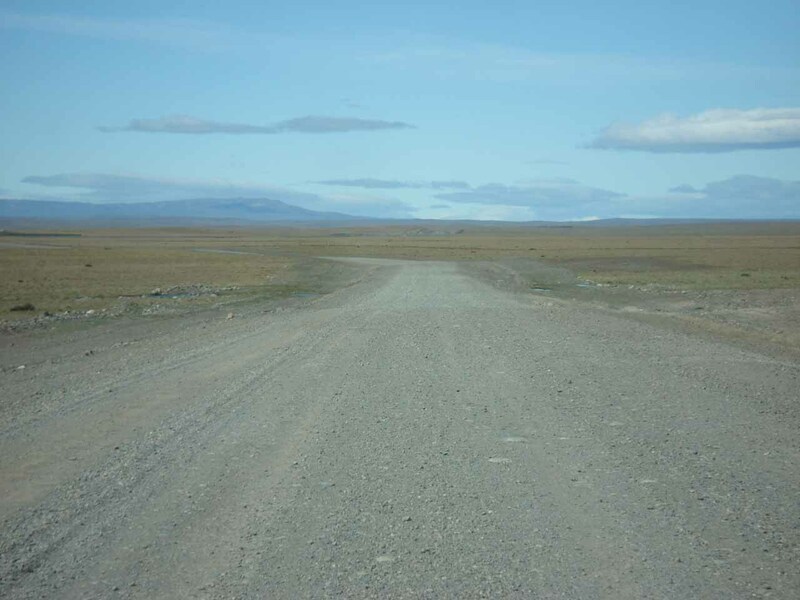 I suspected that we missed a turn somewhere because I never remembered seeing this much paved road when we came from El Calafate a few days ago. Realizing our mistake, we U-turned and headed back the other way (north). Sure enough, the paved road then degenerated into gravel road again. But eventually at 10:20am, we made it back to the Chilean border patrol. Julie wanted me to find a place to pump gas with our remaining Chilean pesos. Unfortunately, it wasn’t easy to find. The reason why was because there wasn’t the conventional fuel station we were used to seeing. 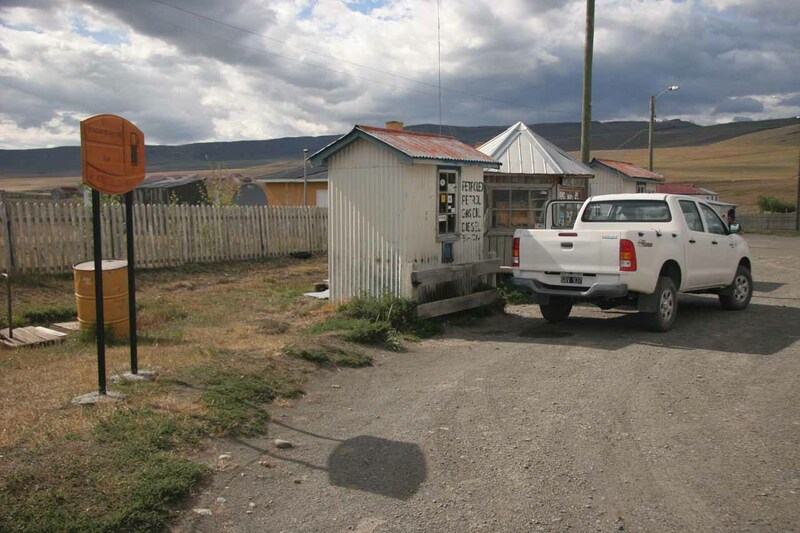 Instead, it was nothing more than a couple of little shacks (one for diesel; the other for unleaded) in the neighboring quiet town. No wonder why this gas station is so hard to find! After doing this deed, we then returned to the border patrol area at Cerro Castillo where we were greeted by a line of cars and a tour bus. Julie managed to get inside the building and wait in line. The border patrol officer told me in english to wait in the car because there were too many people inside the building. It was a good thing I managed to get Julie the paperwork for the car just before I was asked to wait outside. Other drivers were in a similar predicament. Eventually, the tour bus crowd was far enough along with their paperwork and passports that I was finally allowed to join Julie in line. It was a good thing because when all was said and done, we were immediately behind the tour bus now (instead of behind the hordes of cars). Just before 11am, the guards opened the gate for us and we rushed down the unpaved road towards the Argentina border patrol. There, we had to wait in another line behind the tour bus passengers. As cars were piling up behind us, we patiently waited our turn. After another hour had passed, we finally were given the OK by the border patrol in spanish and did the usual drill of lowering the chain barricade, driving past, then re-erecting the chain barricade. Finally at noon, we were able to drive off and head back to El Calafate. As we headed back, we were hoping to see flamingoes in the salt flat, but we were unsuccessful this time around. 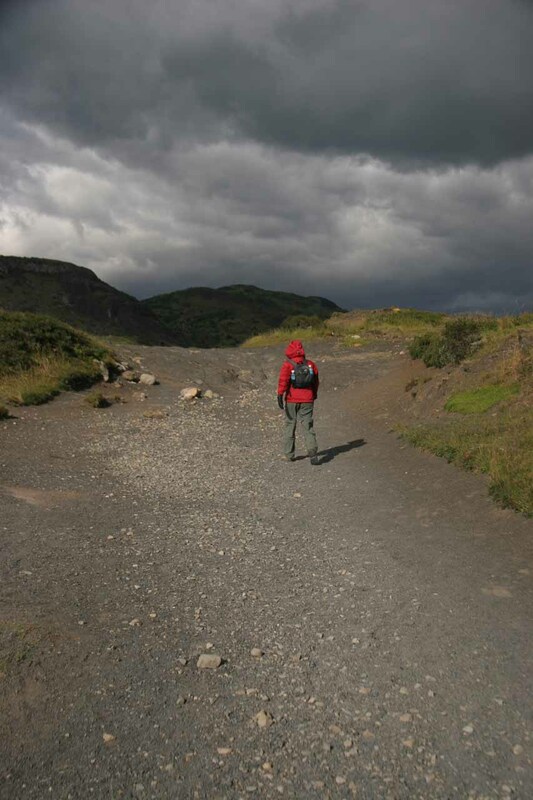 As we approached El Calafate, we managed to drive through a few pockets of squally thunderstorms, but they were few and far between. Certainly they weren’t enough to wash the car. Instead, they just left spots. We finally made it back to El Calafate at 2:30pm with a little less than a quarter tank left. 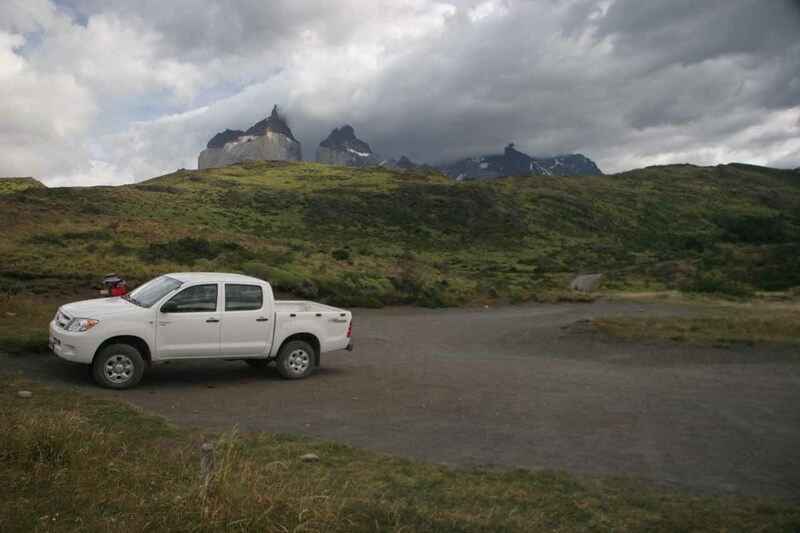 I was amazed at how we were able to do a round trip from El Calafate to Torres del Paine with lots of driving within Torres del Paine on one tank of diesel. I wondered aloud to Julie how an SUV running diesel can accomplish more on a tank of gas than a small passenger car running unleaded gas. In the big picture, I wondered why we don’t have more compact cars running diesel for fuel efficiency. Is diesel really more polluting than consuming more unleaded gas and releasing their toxic byproducts? Or is that something the oil companies and corroborative car companies want you to believe? After checking into the familiar Santa Monica Aparts, we returned the rental truck back to Hertz with no drama. We even returned it a day earlier than expected so we saved another $200 USD there. We then proceeded to walk back to the center of town along Av. del Libertador. The stray dogs were still there. Eventually, we had dinner at Casimiro Biguá, which wasn’t anything special, but it was decent. 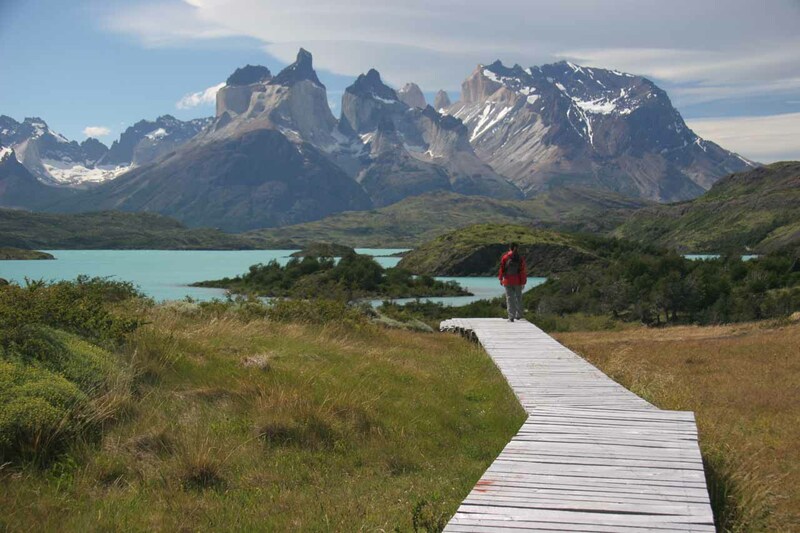 We at least relished in paying Argentinean prices again and not having to put up with the ridiculous Chilean prices at Torres del Paine. 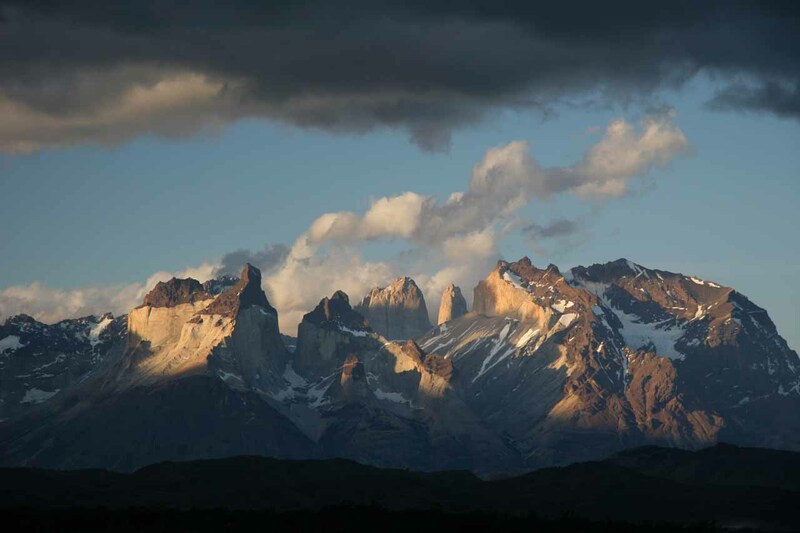 And so ended our run exploring Patagonia. The rest of this evening and tomorrow was spent just killing time in cafes and walking around El Calafate waiting for our late afternoon flight to Buenos Aires while connecting in Bariloche.